It was a cold morning in Beijing, below zero before dawn. 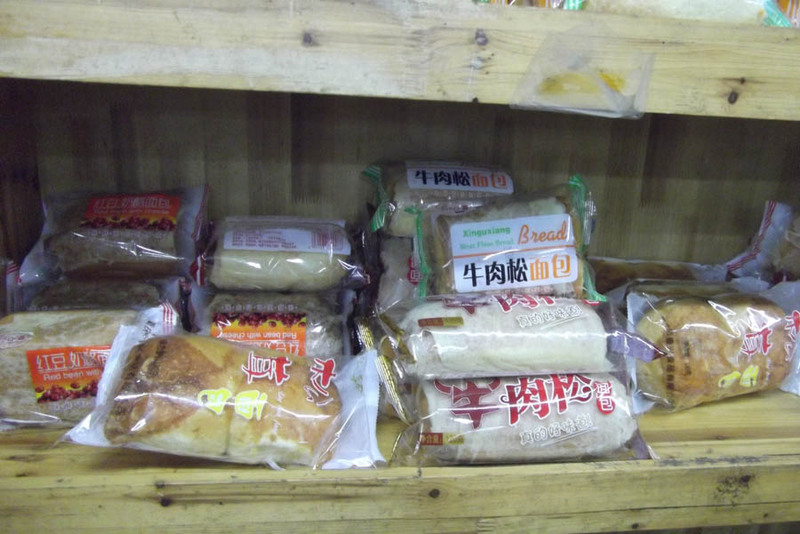 We packed our lunch and were off on the coach at 8 o’clock for the Great Wall, some 45 km away. The Wall originally stretched for over 6000 miles, from the sea in the east to the Gobi desert in the west. 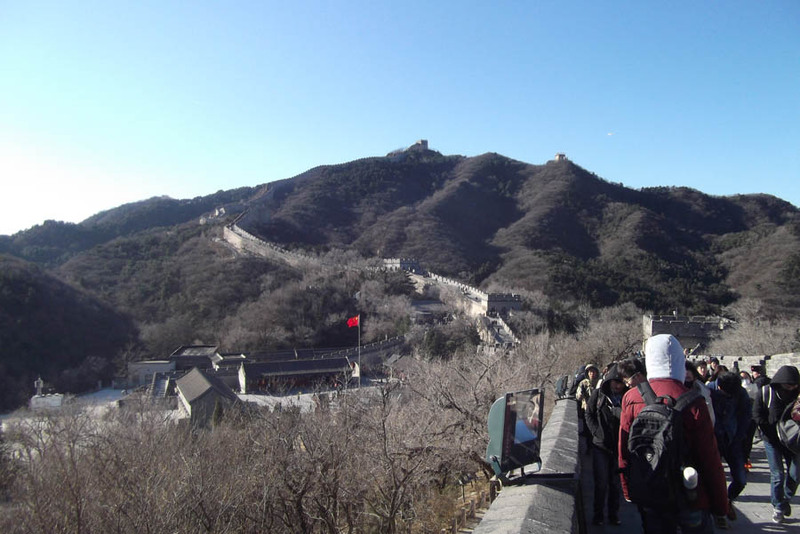 The best preserved section is at Badaling. 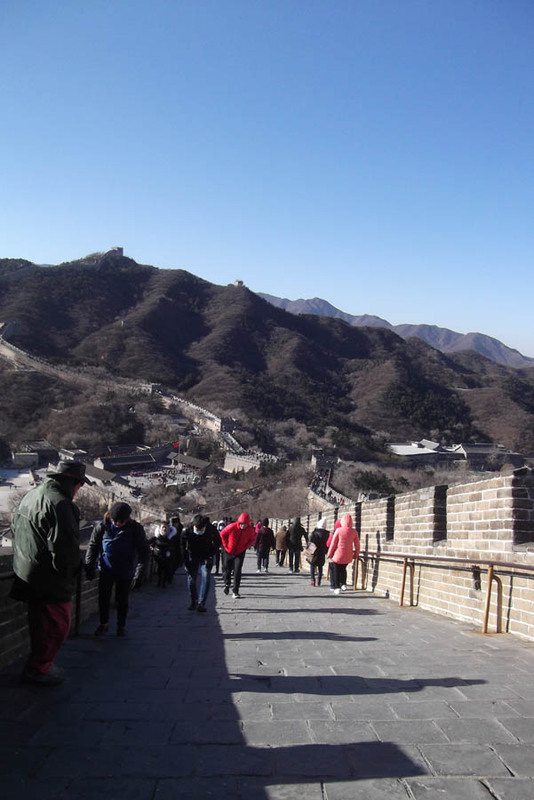 The Great Wall isn’t one continuous structure, nor was it all built at once. 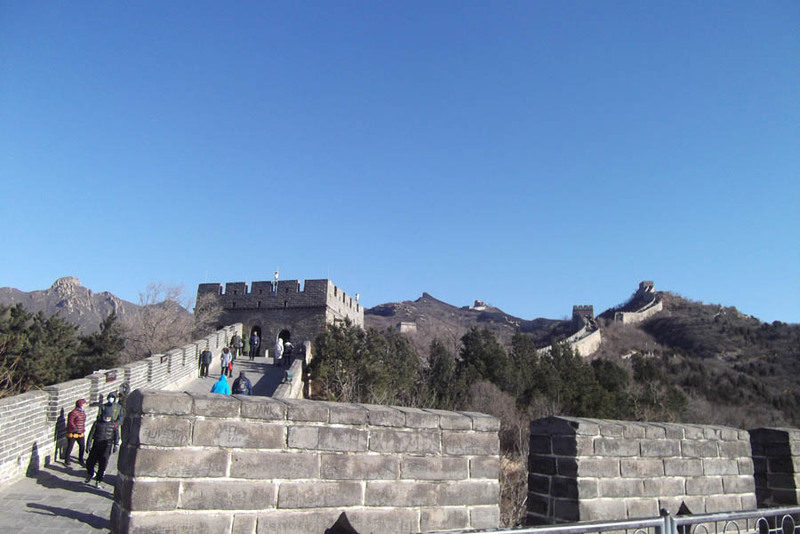 Many Chinese empires and states constructed such fortifications along their northern borders, to protect themselves from the fierce nomads who lived on the wild steppes. As these depended on horses to make their raids, a wall was a useful deterrent. 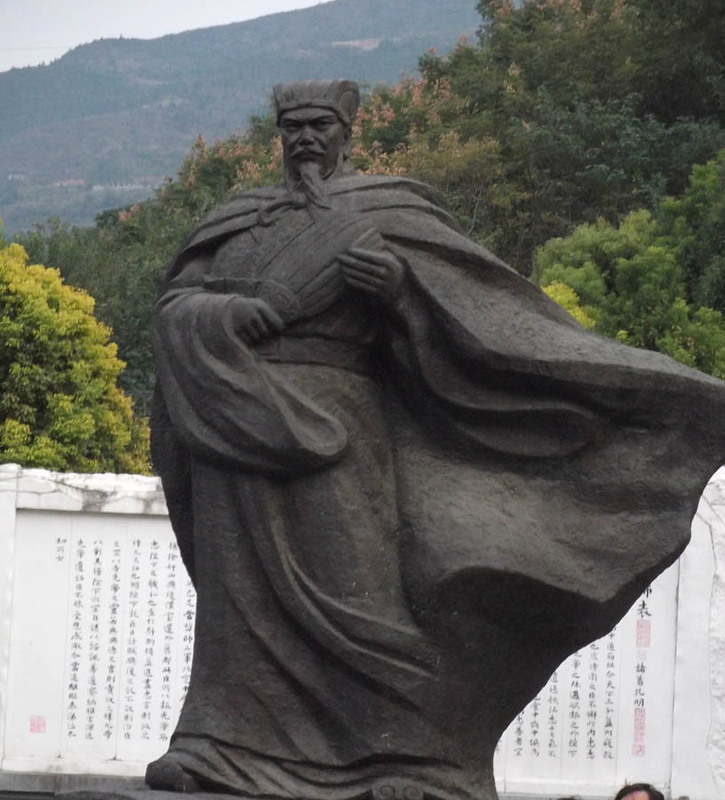 The first Emperor of China, Qin Shi Huang, who we have already met – it was his terracotta army – unified many of these state walls, so is often credited with building the Great Wall. 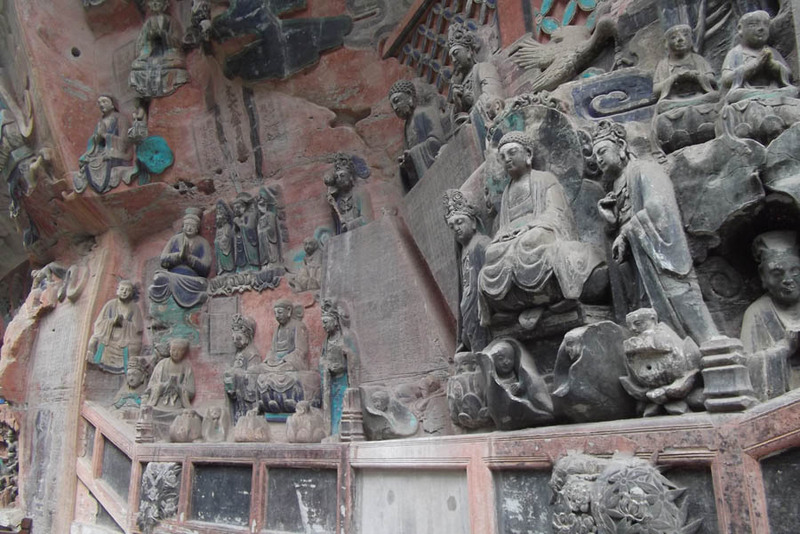 Very little of his actual work survives though; the upgrades carried out by the Ming dynasty (1368 -1664) are what we see today. We disembarked on a plaza surrounded by little shops and found ourselves barely prepared for the bitter cold, worsened by the thin, icy wind. This bit deeper as we ventured out along the Wall itself, which is naturally on the highest ground. The first part of the ascent was steps, then rather steep ridged cobbles. These could have been difficult in wet weather. Although you could walk quite a long way along this section, we only made it to the third guard tower before the cold got the better of us. At least there weren’t the crowds we’d been warned about. We could see that it would be a splendid place for a hike in the spring, following the dragon-like curves away into the hills. 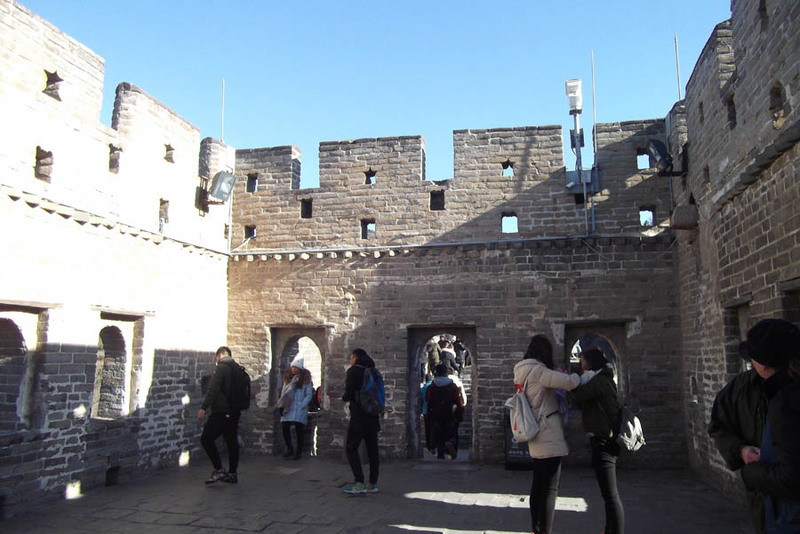 There are hotels in Badaling, as well as day tours from Beijing, but it may not be either safe or permitted to take off on your own for any length of time. A number of guided walking holidays are available. It’s a good policy to check reviews before booking. The surfaces of the walls are covered in graffiti marks scratched into the stone, possibly by the hundreds of soldiers standing guard in this cold and lonely outpost over the centuries. This custom explains the baffling ‘No Scratching’ notices we’d seen around other important monuments! Most of us returned to the Hotel Cafe quite soon. The staff gave us bottles of hot water to hold as we ordered coffee! 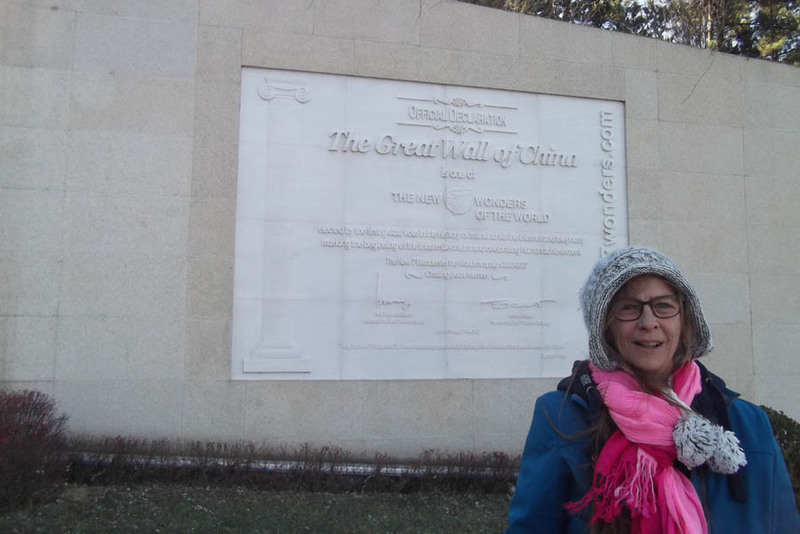 Tired and cold, Linda and I rebelled against the walk in the park and the Ming tombs. We stayed on our tour bus and enjoyed the peace of the country. The bus driver chatted to the persimmon seller at her roadside stall; it was nice to just be there, in an ordinary place. 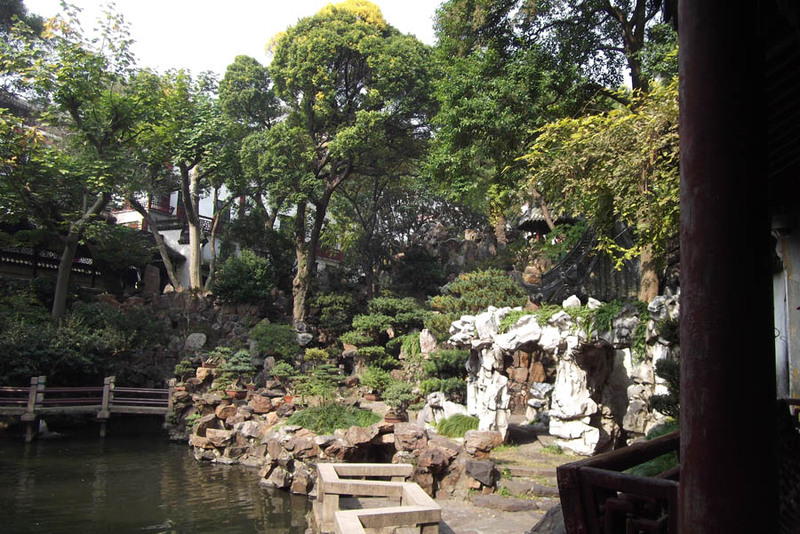 By the time we arrived at the tea garden, we were fairly awake again, and a few sips of refreshing samples were welcome. I bought some Puer tea, which improves with age unlike the other herb teas languishing on my shelf. More elaborate brews unfolded into flowers in your cup! We were offered some optional extra tours – a rickshaw ride, viewing the night lights – but none of these involved going back to the hotel for a rest first. ‘Maybe later’ we all said and grumbled so much we got taken back in time for dinner. Nobody wanted to miss the final day by being too tired! 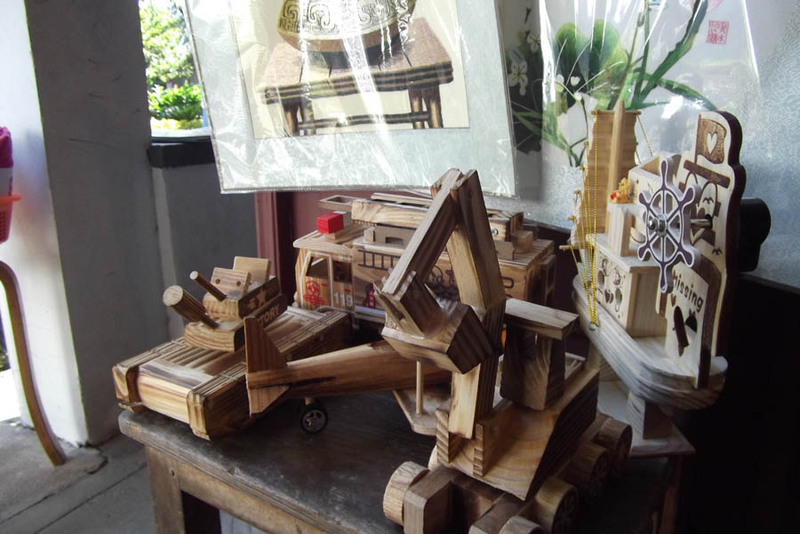 Wooden toys seem more popular than plastic ones in the homeland of the latter! 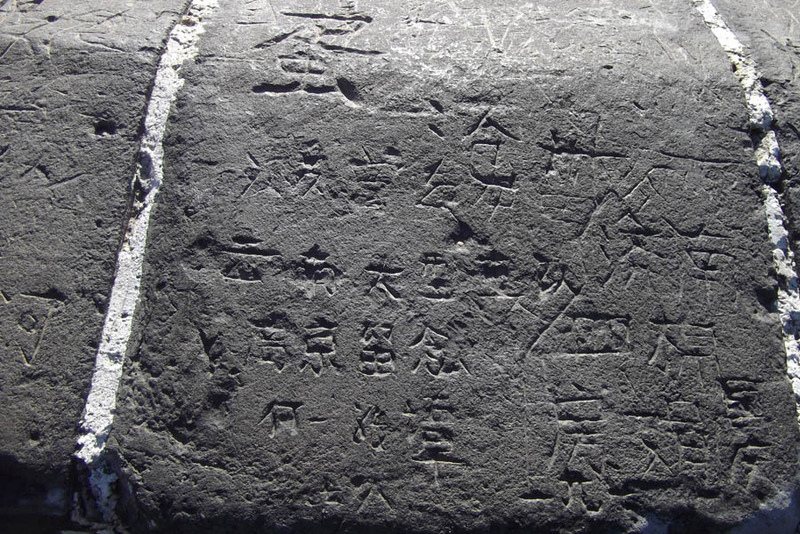 Written Chinese is 1900 years old. There are 8 – 10 thousand characters to remember. 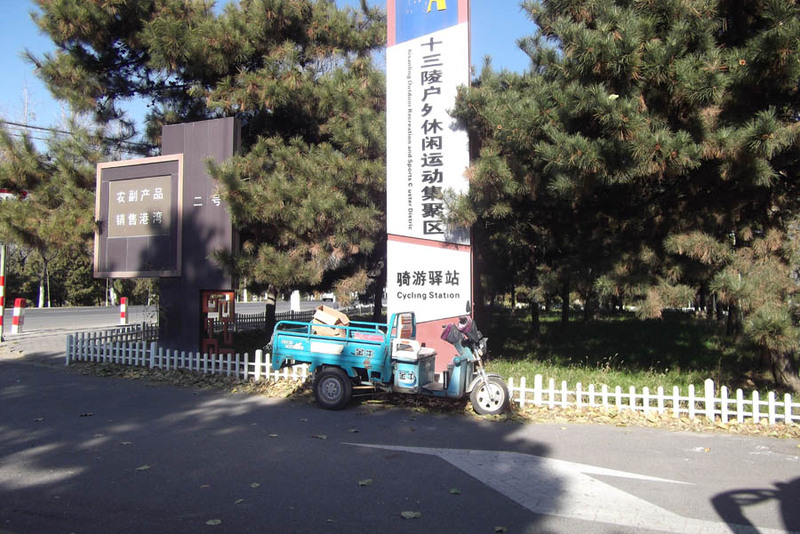 About 2.5 thousand are learned in primary school. 3,000 to 4,000 are enough for everyday life; 5,000 for a writer. Over that, you are counted as an expert. Over the centuries, the complicated characters became very difficult to understand, such that literacy was only possible for the leisured classes. After the formation of the People’s Republic, written Chinese was simplified in various important ways, and now nearly everyone can read. 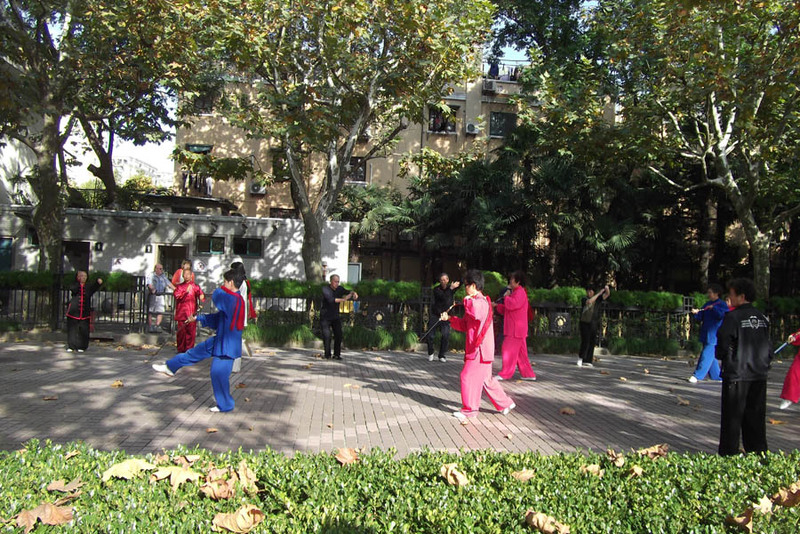 We’d turned down the morning call, so we slept in till 7 am, missing the 6.30 Tai Chi class again. 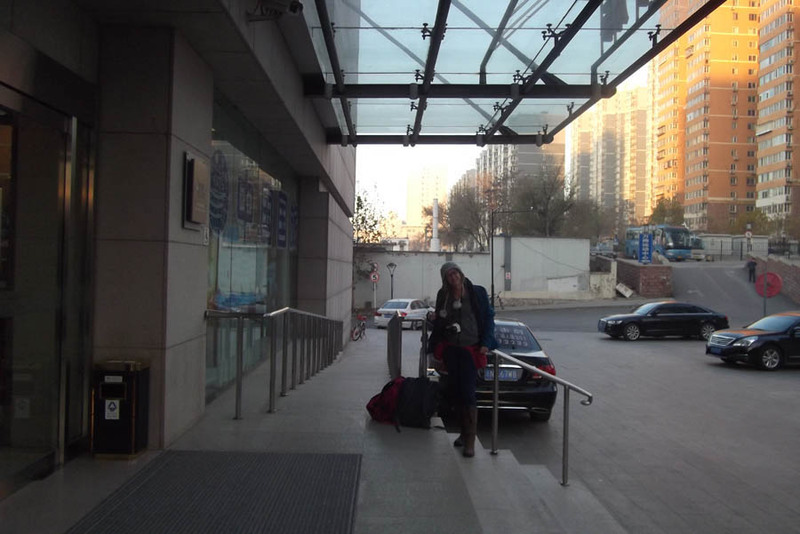 After a hasty breakfast, we were in the lobby by 7.45 ready for the inclusive trip up the Shen Nong Stream. We sailed up this tributary in a smaller ship, passing through amazing wooded gorges with caves and the strange hanging coffins. These were usually carved from a single log and placed in caves or crevices in the cliff faces. They date back to the Stone Age and no-one knows why or how the people did this; it would have been a very difficult task. 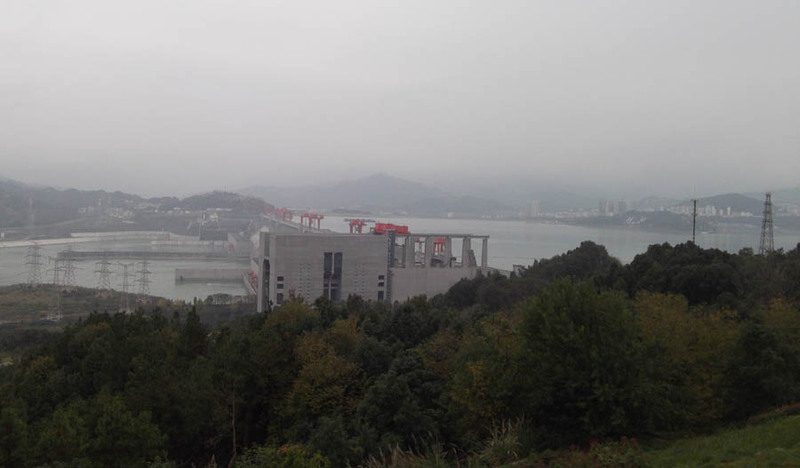 Other cultural artefacts and lifestyles are submerged now the Three Gorges Dam has raised the water level here by 90 metres. 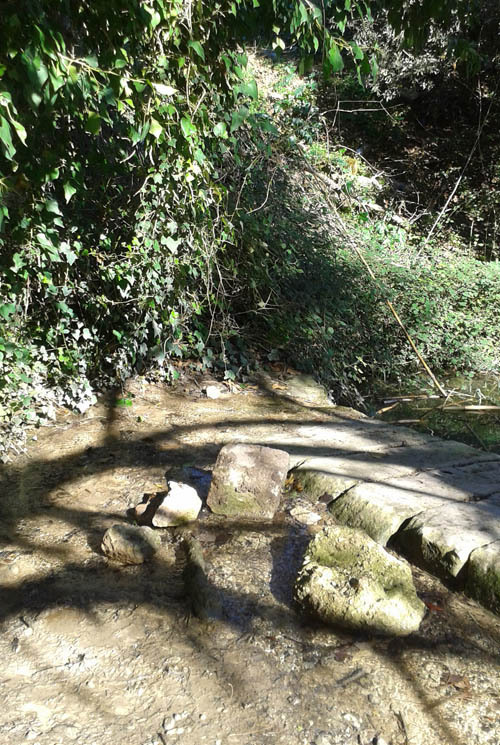 Our tributary was once a fast mountain stream, hurtling over rocky rapids. Now it’s much deeper and slower, but the banks are still teeming with invisible wild life. Panda (cotton) bamboo grows there, but the panda range is now further south. Huge swallow nests hung from cave roofs; when the boat engine quietened, we could hear other birds singing. Once we saw a small flock in the treetops, but mainly they kept out of sight. We pulled in at a jetty and transferred to small wooden boats. A man on the bank demonstrated how these boats used to be towed upstream when the river level was lower. The boatman sang us a traditional song from his drowned culture. Then we encouraged them to race the other boats, singing them sea shanties till we came in first! Back on the ship I had to fix my camera – it turned out that the White Elephant batteries we’d bought locally could run out rather abruptly with no warning – so I was late down for lunch. I had to take dessert up to the coffee lounge to admire the Wu and Qutang Gorges as we passed through them. There was a standing stone sacred to the Goddess at the entrance, and dragons in the hills. 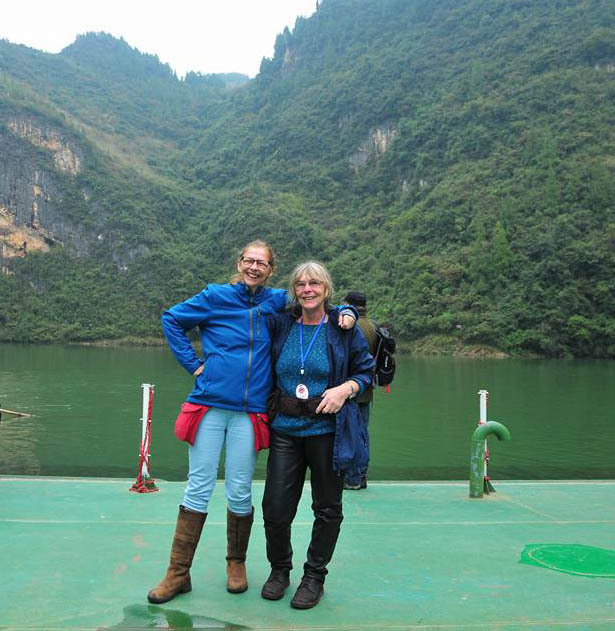 After this, we moored for the White Emperor City tour (optional extra, well worth it). We teamed up with the Bavarians (also here on an RSD tour) to make up numbers, and had a very knowledgeable and well educated young Chinese lady as our guide. Running the gauntlet of the ‘maybe later’ market, we discovered that each stop had a different speciality, probably for the internal tourist trade. We were swiftly guided past the water gate, a Post Office kiosk and statues of famous poets. 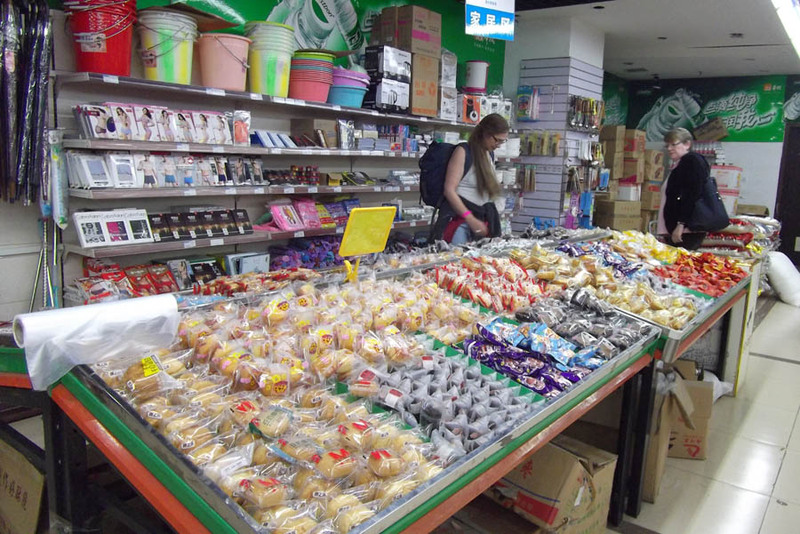 We cut through a large indoor market full of exotic foodstuffs. 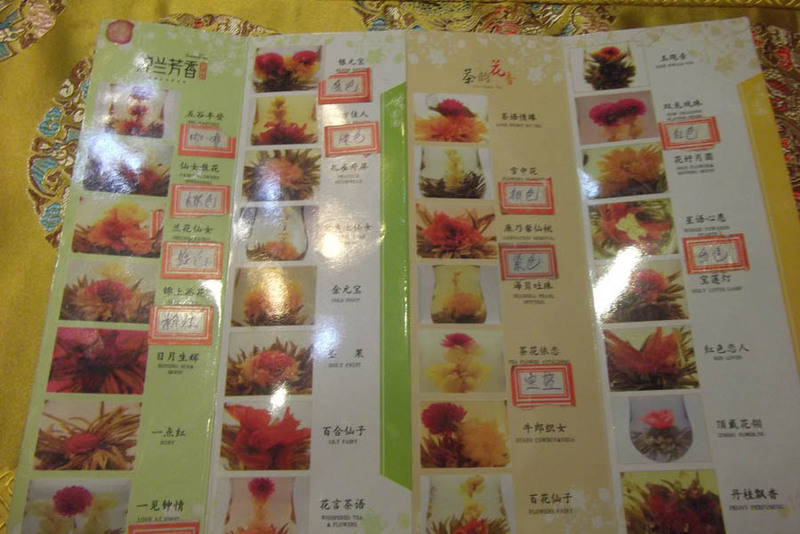 I longed to try some of the huge range of dried mushrooms or take some of the exotic nuts home to identify them, but of course it was impossible. There are severe restrictions on casually transporting vegetable matter across continents, in case they harbour insect pests which can devastate crops. 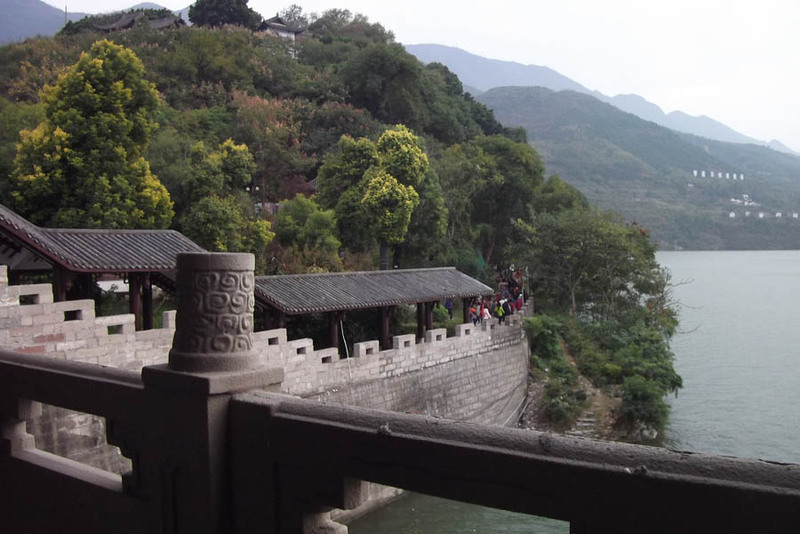 Finally, we crossed a long bridge, chilled by a stiff breeze, and into the White Emperor City. Researching these tours had warned me of over 700 steps to climb; the information was out of date, as the inundation had reduced these to 346. 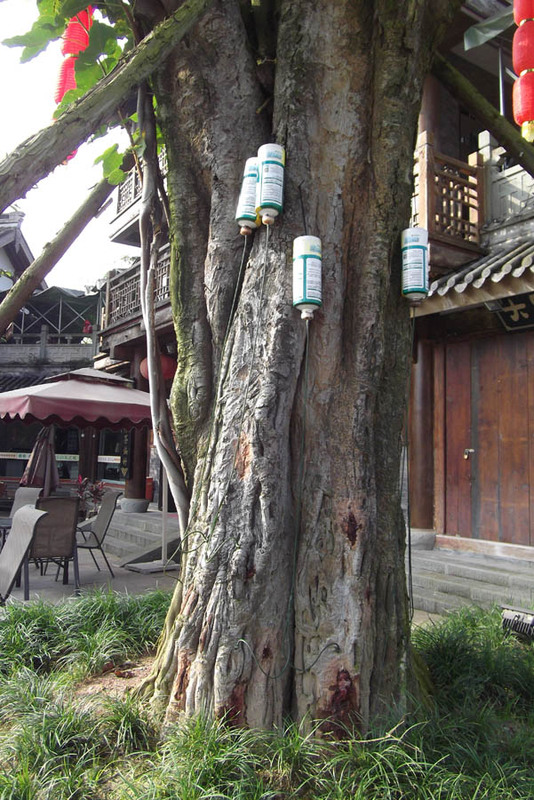 The sedans, bamboo chair litters, were still available to hire for the climb; they now cost 100 yuan rather than 10 yuan. We didn’t use them. ‘You don’t mind a walk,’ suggested our guide firmly. 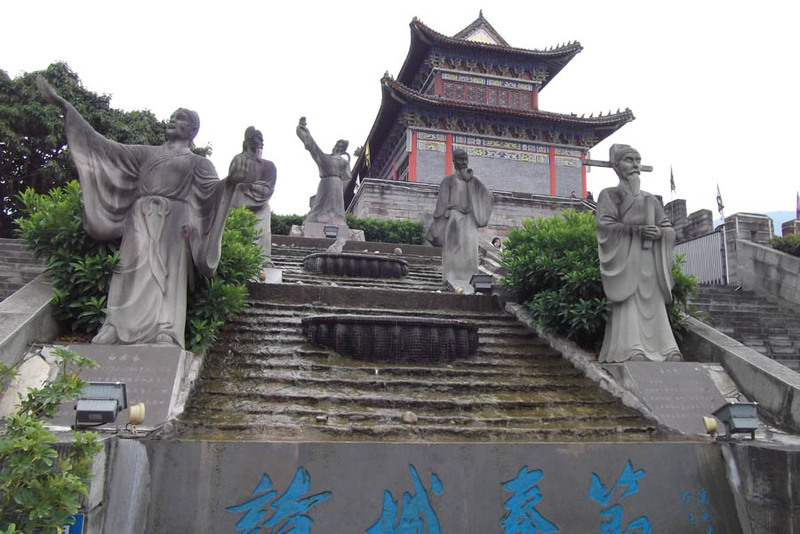 The first sixty stairs brought us to Loyalty Square, celebrating Zhuge Liang, a prime minister of old renowned for his honesty and wise counsel. 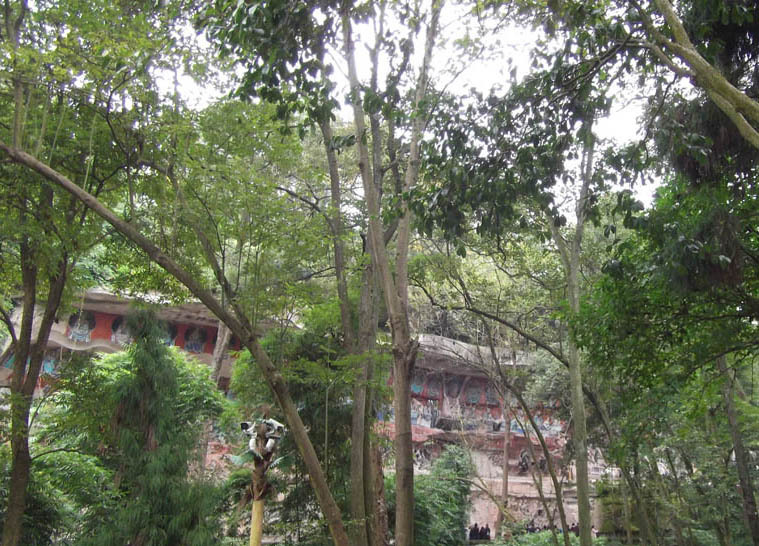 There was a stupendous view of the ‘Entrance to the Three Gorges’, a very strategic site in ancient times. A huge rock there, an ancient landmark, had to be blown up after the first of the three inundation stages; submerged, it would have been a shipping hazard. We climbed many more steps to the summit, passing an archery range. 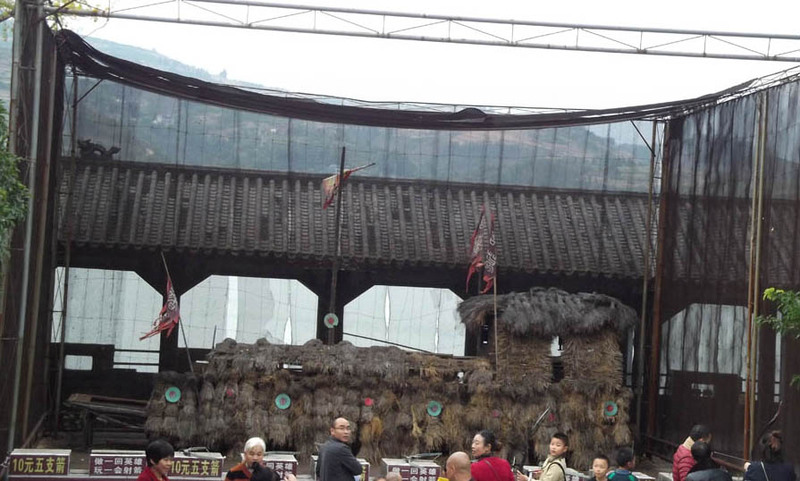 Visitors shot arrows at straw men to celebrate ‘Taking arrows from the enemy using straw men’. 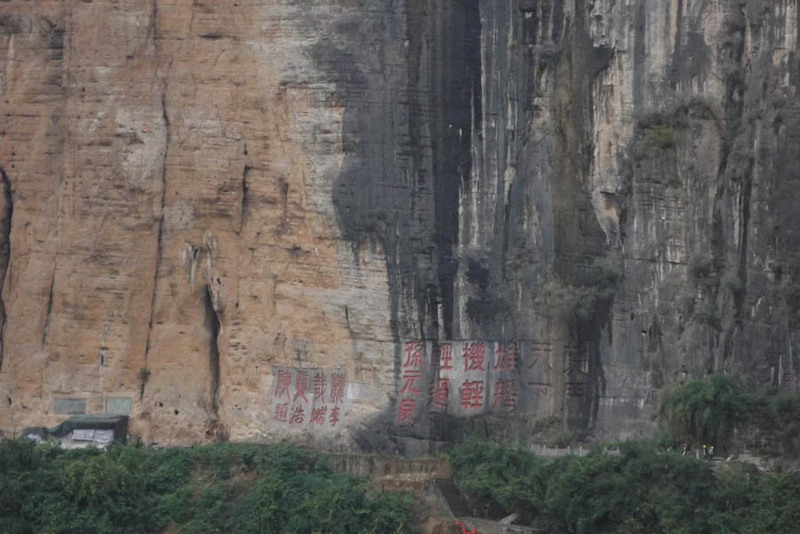 This was a famous strategy of Zhuge Liang, as featured in the film ‘Red Cliff’. 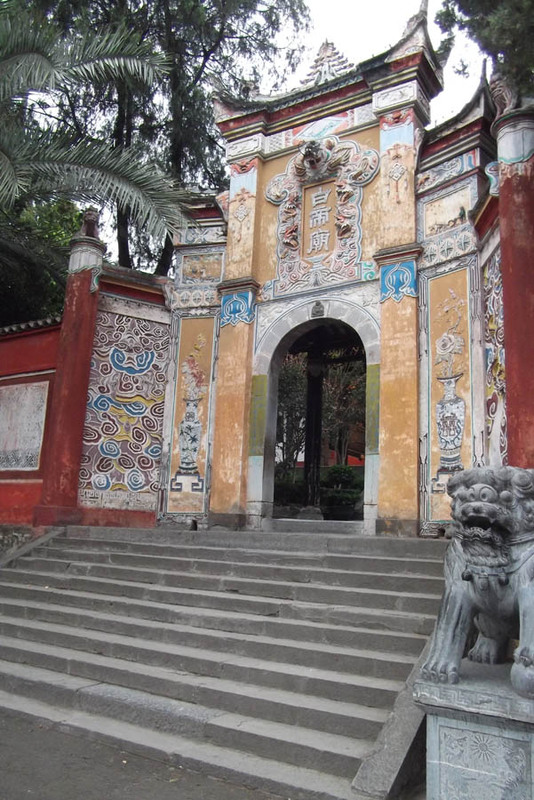 On the far side of the ornate painted gate at the top of the stairs was a huge dragon statue. 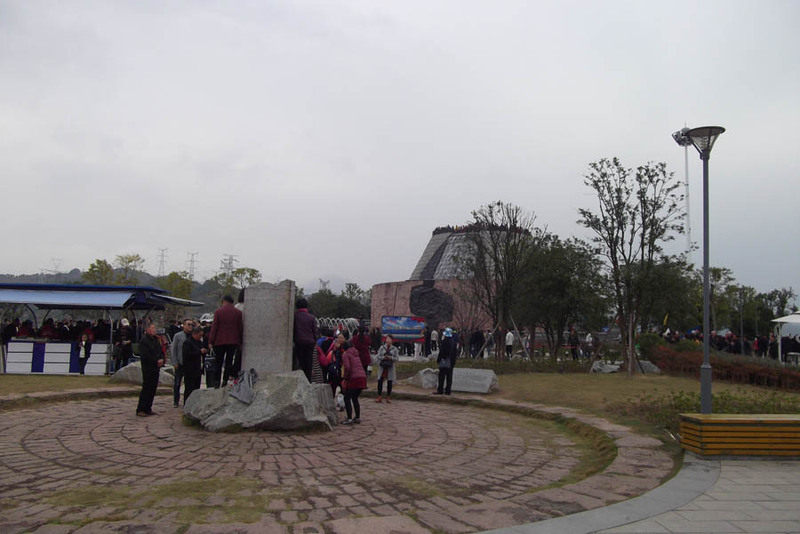 The founder of the city, Gongsun Shu (or someone else), saw a white dragon rising from a well (or in the form of a cloud). 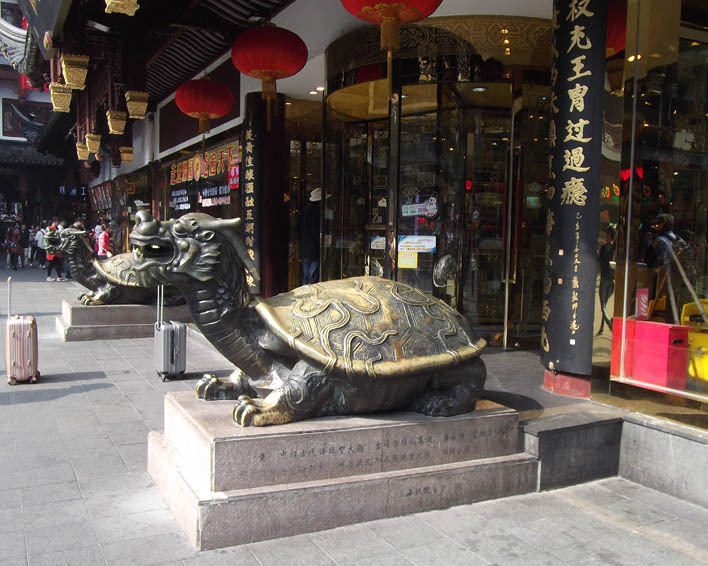 The white dragon was considered a good omen for founding a city there anyway, and it remained untouched during the warlike period which followed. 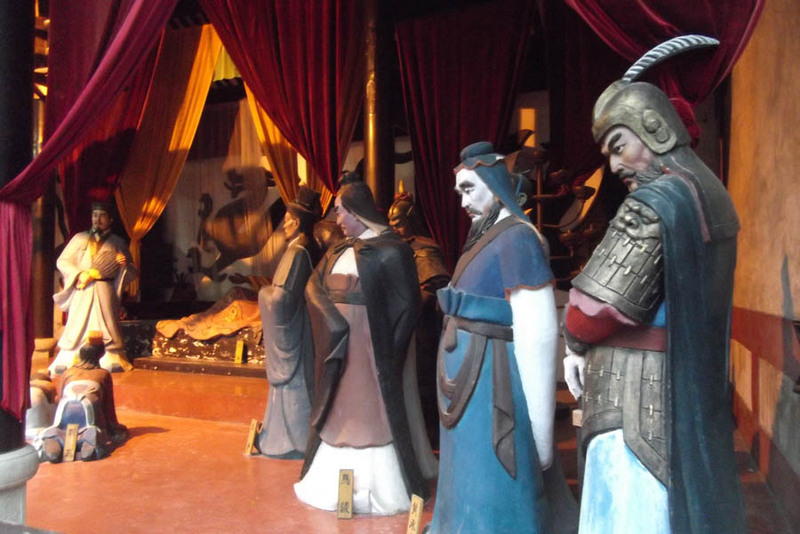 Inside the buildings was a large tableau, with very expressive figures, depicting the story of ‘Handing over the Orphans’ where Liu Bei (a hero of ‘Red Cliff’) calls Zhuge Liang out of retirement to look after his two young sons. 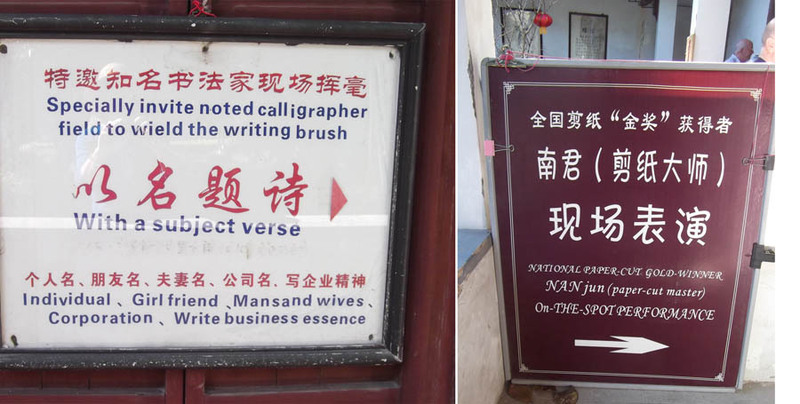 This ancient city is also famous for poetry, though the displays were being packed away for the evening. Our guide managed to show us how bamboo, pomegranate and plum were often used to decorate scrolls. Their survival over winter made these plants symbols of endurance. We also learned that the purpose of the high thresholds – which we’d assumed were some sort of flood control – was to keep zombies out! The walking dead in China can’t bend their knees. In addition, you had to bow your head as you entered a room, to watch your step, so automatically kowtowed. It was important to step right over and not set foot on the lip of the threshold. Returning down a different set of steps as the light began to fade, we passed through the closing market, and the evening street food vendors just setting up, to the ship. The whole point of an adventure is that you don’t know what will happen. However, you rather hope it will be enjoyable, so it’s worth doing some research before you go. Energy – do I need an adapter to use the local electricity? Food – what food hygiene advice is there? Is there anything I shouldn’t eat? Will I encounter problems with my food allergies? Water – can I drink the tap water? If not, why not? 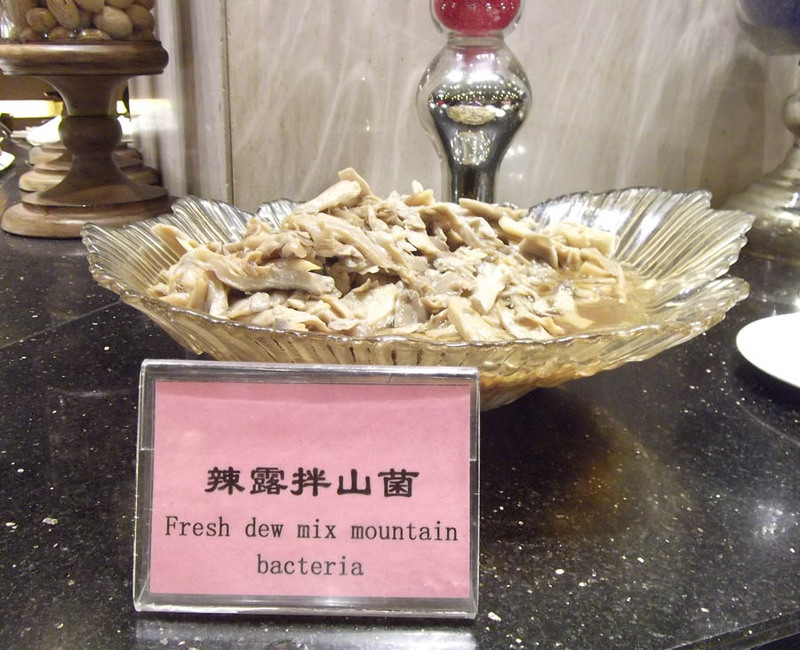 Does it just taste salty, as in Malta, or should I avoid getting any in my mouth while showering, as in China? Environment – what hazards might I encounter? Should I get vaccinations, bring special equipment? No matter how much I prepare for an adventure, there’s always more to learn about the places I’ve been. I enjoy reading up about them back at home; my colleague and I have developed a taste for Chinese films and dramas, especially historical ones unfolding against the landscapes we just travelled through! 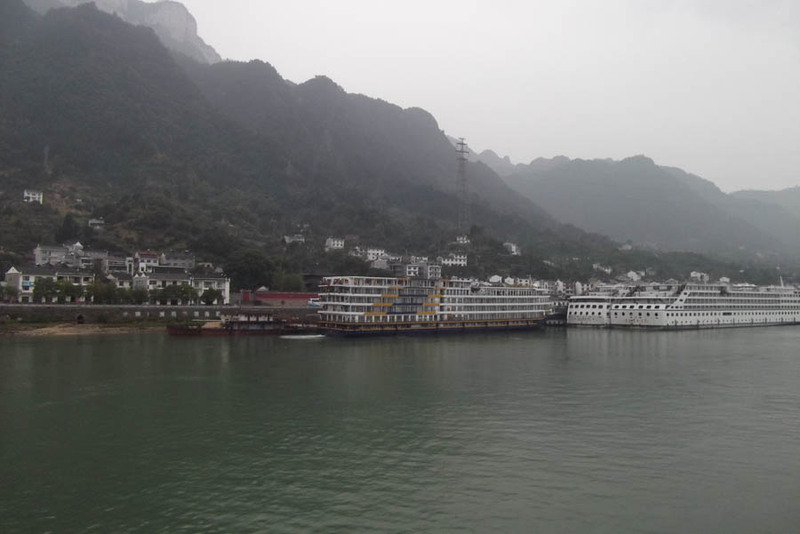 Exhausted by the long train journey from Shanghai to Yichang, we barely registered our late arrival on board the river cruiser ‘President Number Six’, except to note with relief that we had our promised balcony. We awoke to the 6.30am cheery morning call, swiftly learning the volume function of the mysterious dials under the mirror! Another ship was moored parallel to ours – you could practically step across to their balconies, so it’s a good idea to close the outside doors if you’re on a shore excursion – but it glided off before we’d made our first coffees, revealing a stunning vista of white cliffs and dark forest. 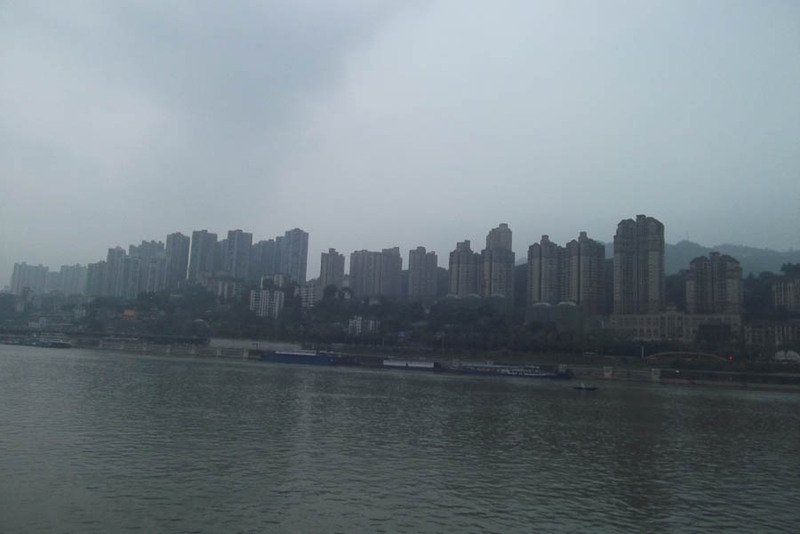 After the hectic pace of the city tour, the peaceful riverbank scenery was delightful. Far from being pestered to join in the optional excursions (priced at around 290 yuan, about £30 at the exchange rate then), we weren’t even allowed on the first one, there being no English speaking guide available. We’d already planned to try and avoid this trip, hoping that it wasn’t part of a compulsory package. 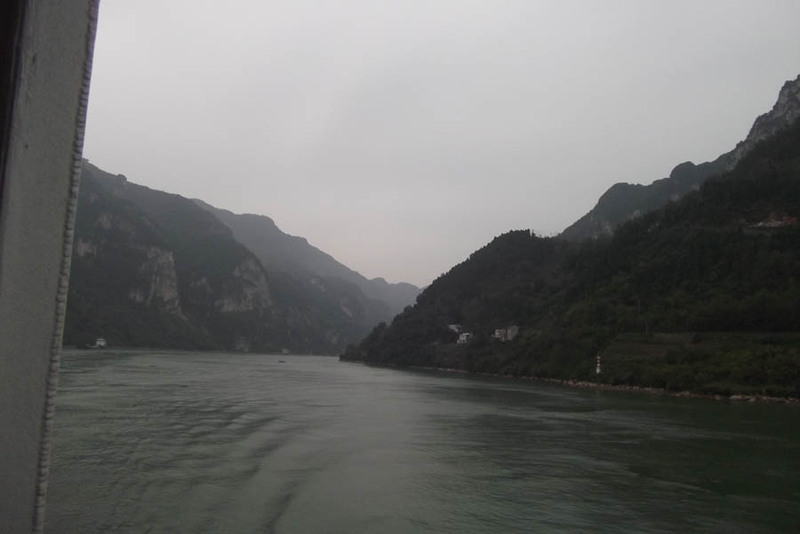 Although a visit to the home town of Qu Yuan, a famous poet from the Warring States period, was tempting, we knew we’d need some rest before tackling the Three Gorges Dam inclusive excursion later. We were content to explore the ship and admire the view. The weather was still mild enough to enjoy sitting out on the deck, or sketching on the balcony; we began to move upriver. 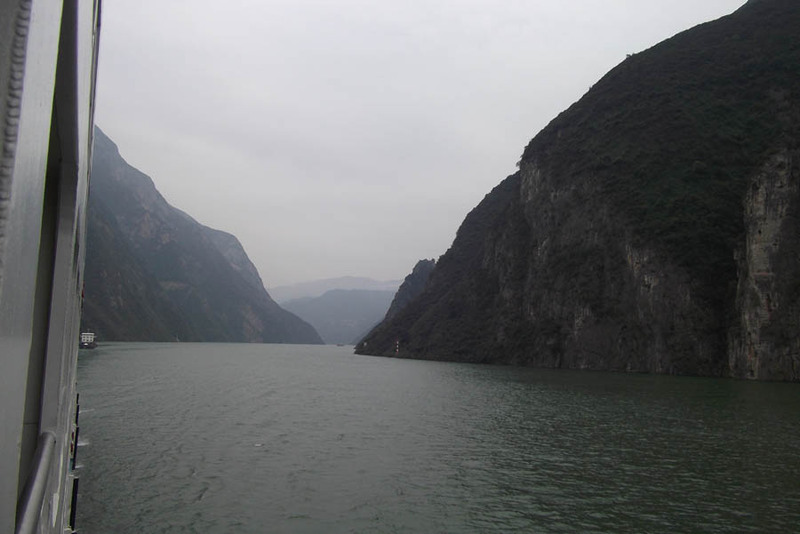 Our ship glided smoothly through the calm waters past ever changing views, through everyone’s stories, towards the Dam. 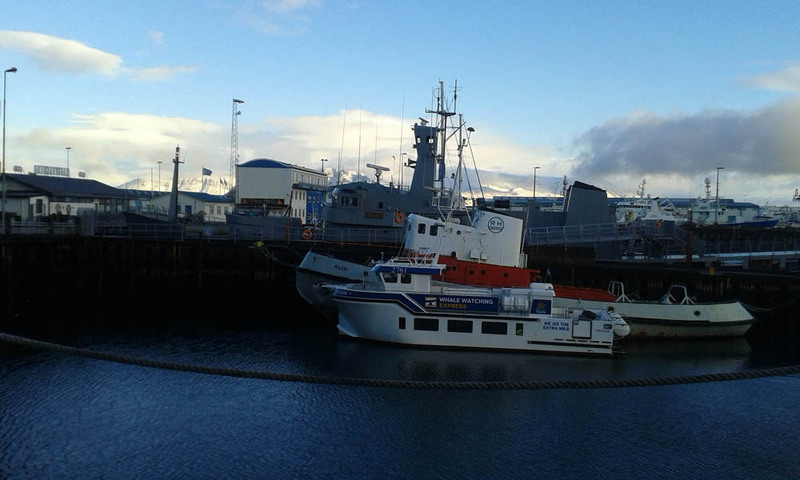 We discovered the ships always moored in parallel. Landing parties had to walk along internal gang planks through other cruise ships and over the bare decks of commercial barges before finally reaching shore. Our group was promptly assailed by husslers, politely but insistently offering us T-shirts and maps of China. This, we learned from our guides, was the ‘maybe later’ market. The prospective vendors seemed to have some invisible boundary, and they were never a real pest. Their goods weren’t too bad either; I actually bought one of the maps, though I probably paid too much for it. Apparently you have to watch out for counterfeit money in change though. 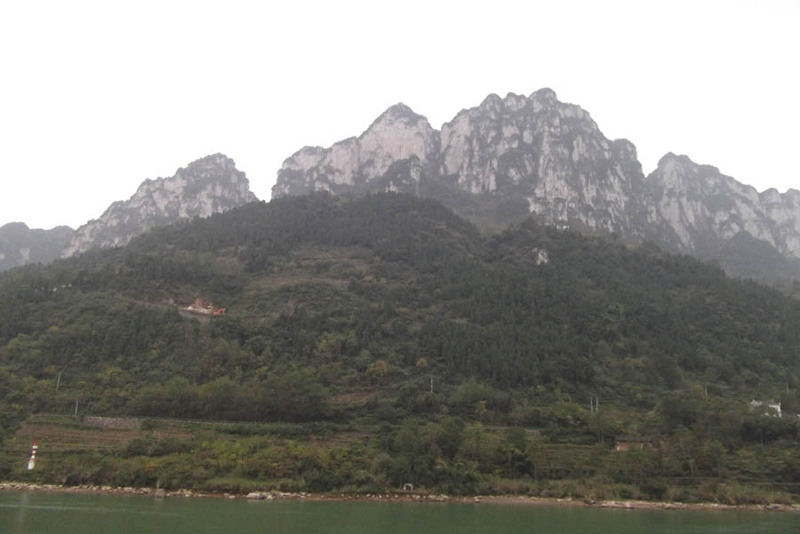 A tour bus took us up the winding road to the Visitor Centre, thronged with Chinese tourists. 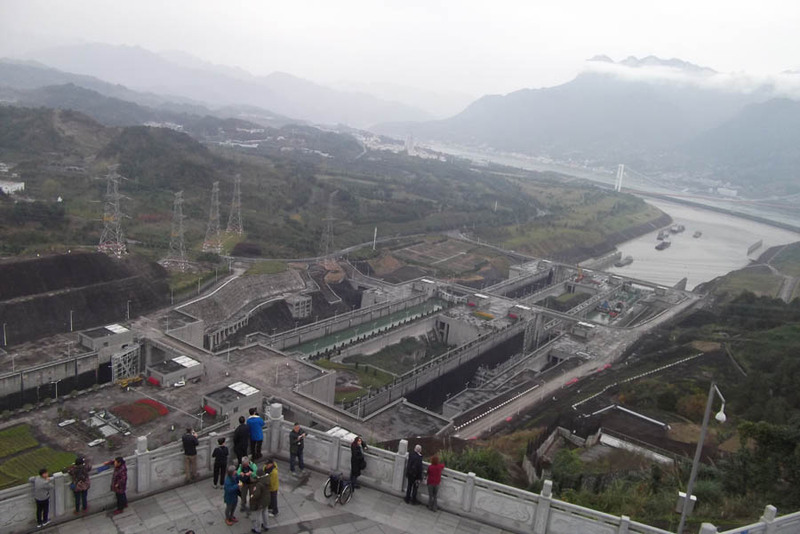 We were introduced to the 3D model of the dam complex, touched briefly on souvenir shops, then ascended to the summit up four long outdoor escalators. We were lucky with weather ourselves, but an umbrella could be a handy item to bring. 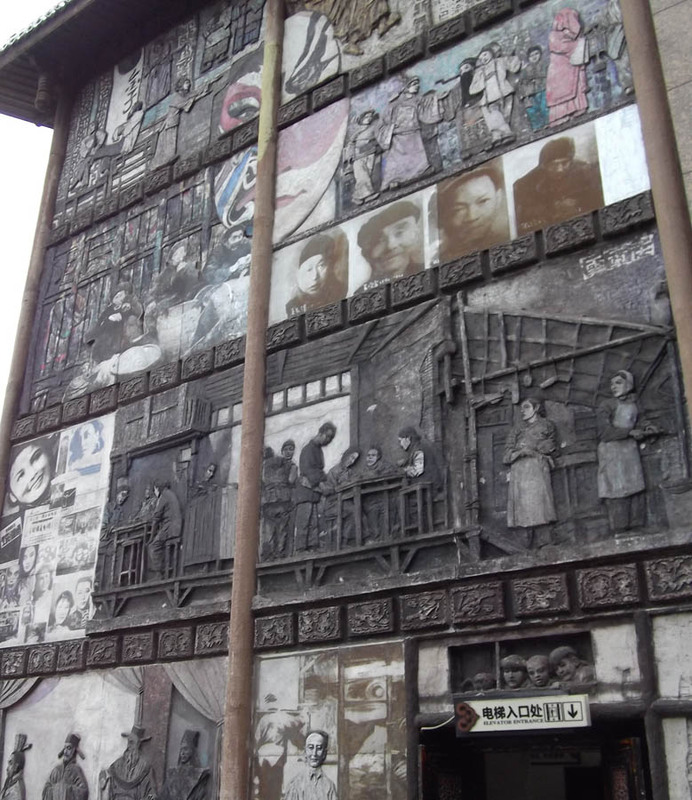 The summit plaza itself was decorated with significant statues, murals depicting drowned cultures, and information boards. Stairs led to the viewpoint at the very top – for, of course, the view was the main attraction. 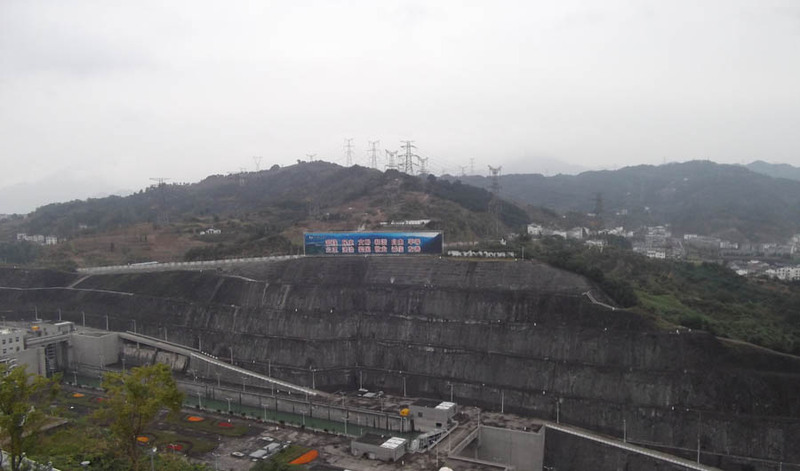 Building this steel/concrete gravity dam, long planned, was finally started in 1994 and completed in 2012. 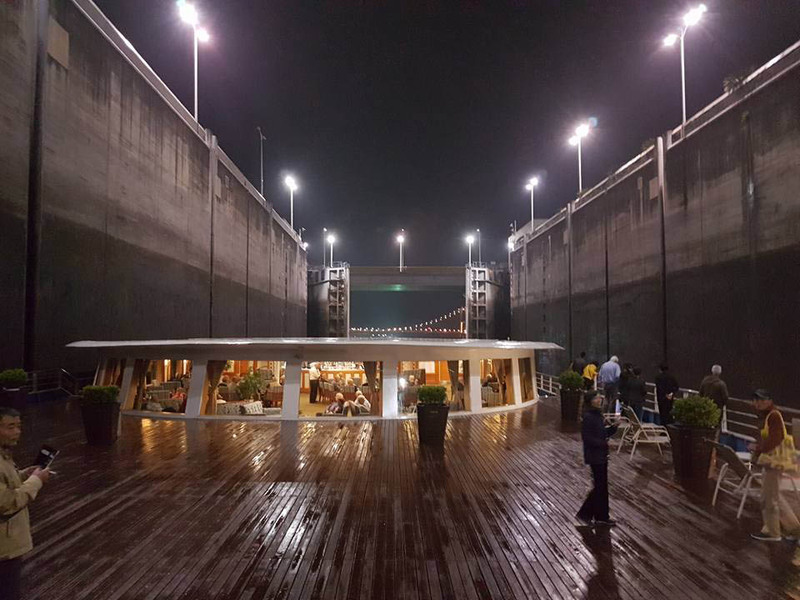 The ship locks and lift were finished later; our vessel was too large to go up in the incredible ship lift itself. 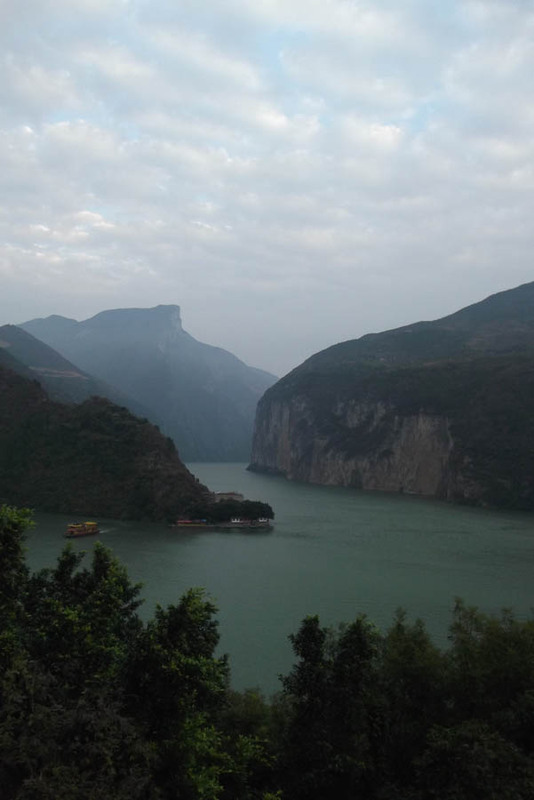 The dam is 1.2 kilometres across and creates a reservoir 600 kilometres long, reaching all the way to Chongqing. Its output is 22.5 megawatts; half the average UK power demand. The landscape of the entire river was altered by this project, and over a million people had to be relocated. 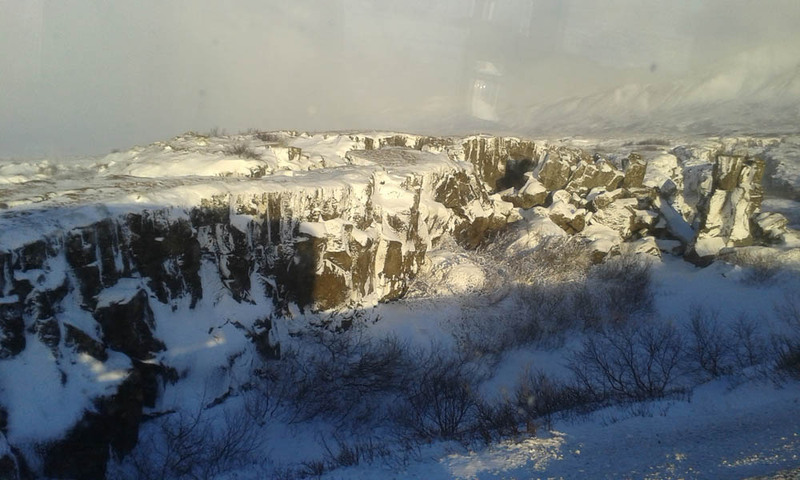 Many scenic features were covered by the 90 metre rise in water levels. Silt builds up in the reservoir instead of being washed downstream to fertilise the soils. Some endangered species, such as the Siberian crane and Yangtze sturgeon, may not survive the changes. 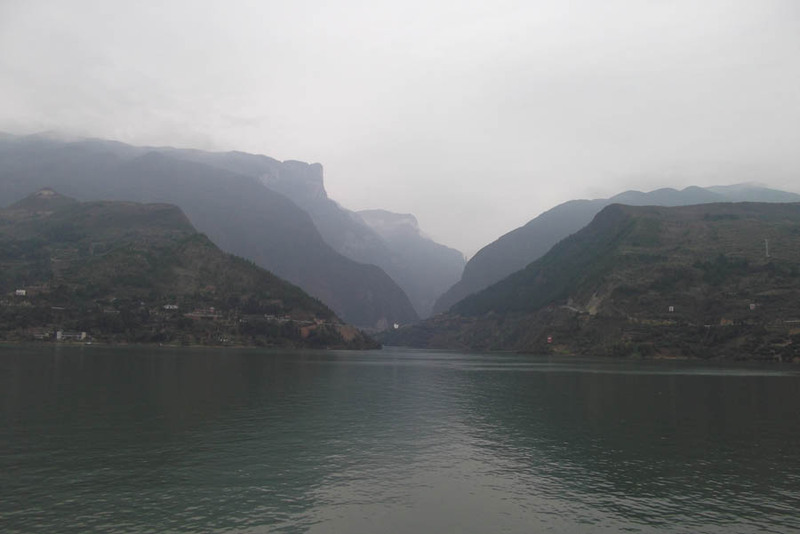 However, having experienced the pollution caused by the coal fired power stations elsewhere, the clean air of the Three Gorges, where white mists replaced brown smogs, was a powerful argument in favour of hydropower. With the deeper channels, goods can be carried by ship instead of fleets of diesel lorries. 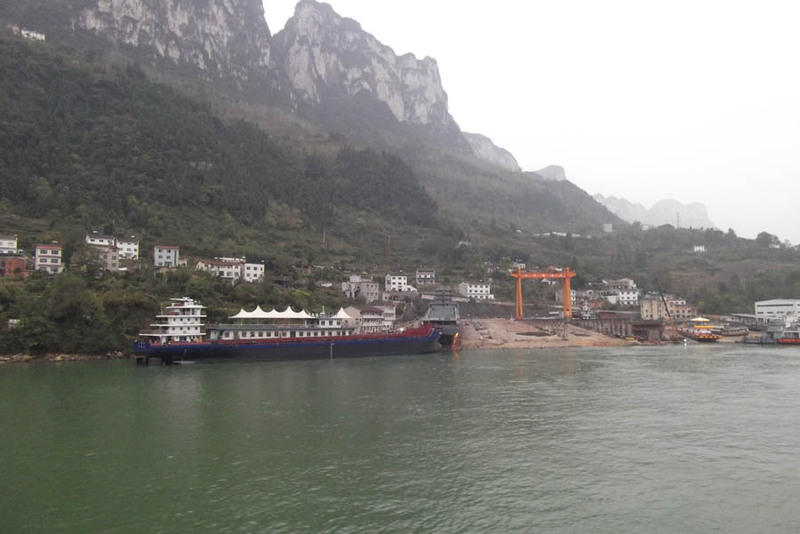 Floods no longer threaten the densely populated Yangtze basin and the coastal towns. These could be devastating. In 1998, over three thousand were killed and 15 million homes destroyed. In 1954, the floodwaters covered the entire city of Wuhan for three months; over thirty thousand people died and 18 million were displaced. 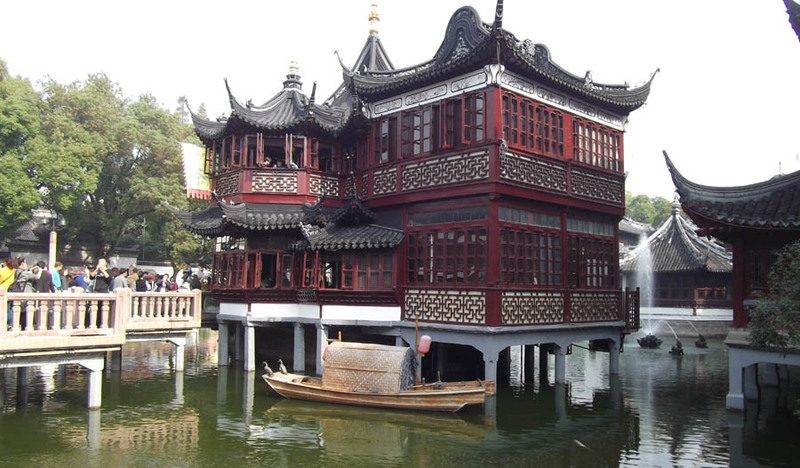 The catastrophic flooding of Nanjing in 1931 claimed at least two million lives. Great advances have been made in weather control! The way back down was a gentler stroll down flights of stairs and through parkland, bringing us out into a charming market full of affordable souvenir trinkets. We hastened through this, back on the bus, ran the gauntlet of the map sellers and were welcomed back on board the ship with hot flannels and tea. The ship moved off soon after we returned; there was an indefinable air of tense excitement among the crew. 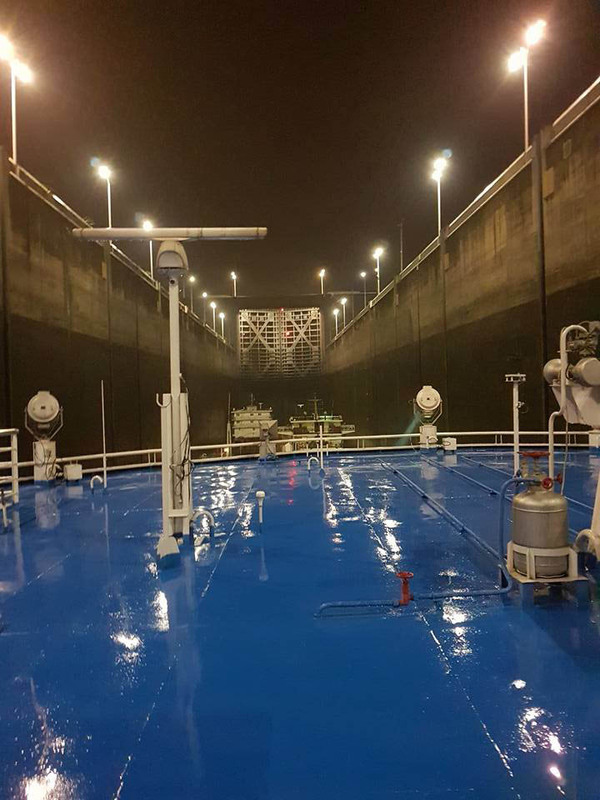 By the end of dinner, we were in a holding position in front of the huge lock gates; the rain considerately stopped while we waited on the deck. I thought we’d just move to the front of the queue but, in an amazing feat of pilotage, all three large ships entered the lock together. The great doors clanged shut, and the water began to run in. We rose surprisingly fast – ‘up’ is not a direction usually associated with ships! In less than twenty minutes, we’d emerged from our concrete chasm and could gaze out over the landscaped working areas. The second lock swung open and we moved through in a tight group. It took about two hours before we emerged from the fifth lock onto a broad, placid lake. The sharp line of the dam, crested by illuminated machines, retreated into the night, and we were on our way to the Interior! RSD don’t do relaxing normally, but here they were in the hands of the cruise ship agenda. 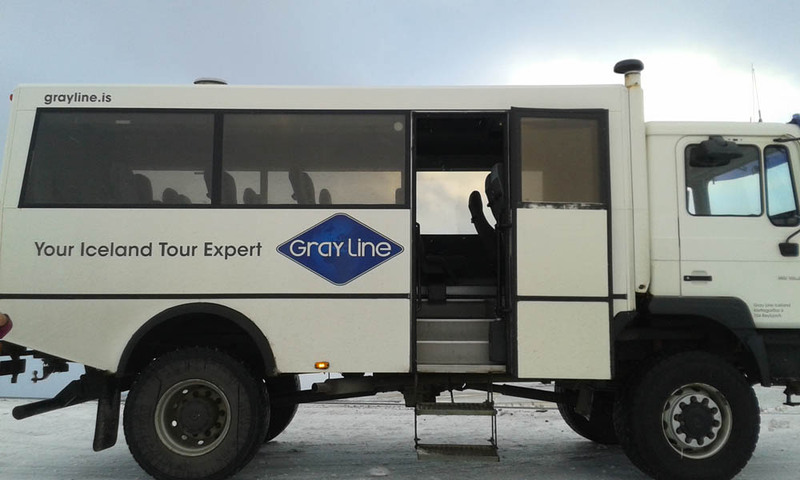 So there wasn’t much advance information about the shore excursions available, some of which are included in the price, but a little research shows these are usually much the same for all the cruises, differing slightly whether you are going upriver – as we were – or down. It was a relief to find that our cabin – like most places we stayed – had a kettle. Remember to use bottled water for hot drinks. There is often more tea supplied than coffee, so if you prefer the latter, bring some extra sachets with you. 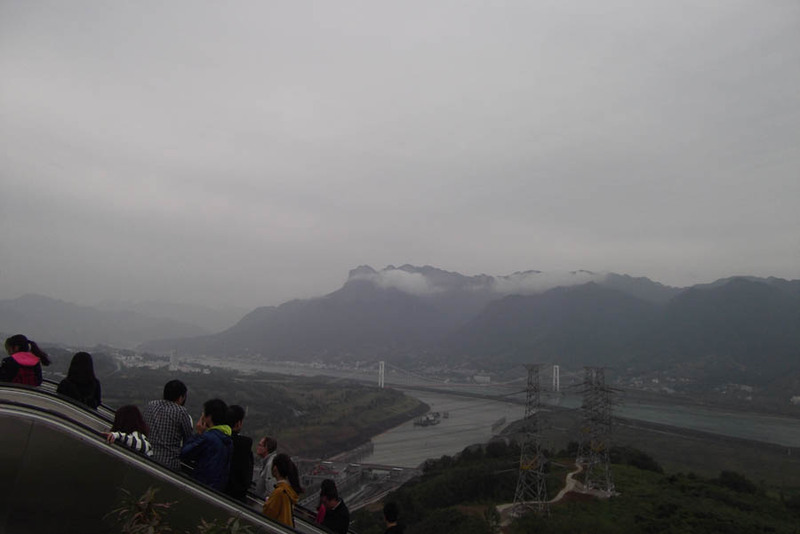 You can visit the Dam from Yichang; it’s about a 90 minute drive. It may be possible to book an excursion which takes you up the ship lift. After a busy day at the water village, we still had time for one more trip on the way back to the hotel. There’s a definitive division of opinion about going up very tall towers. 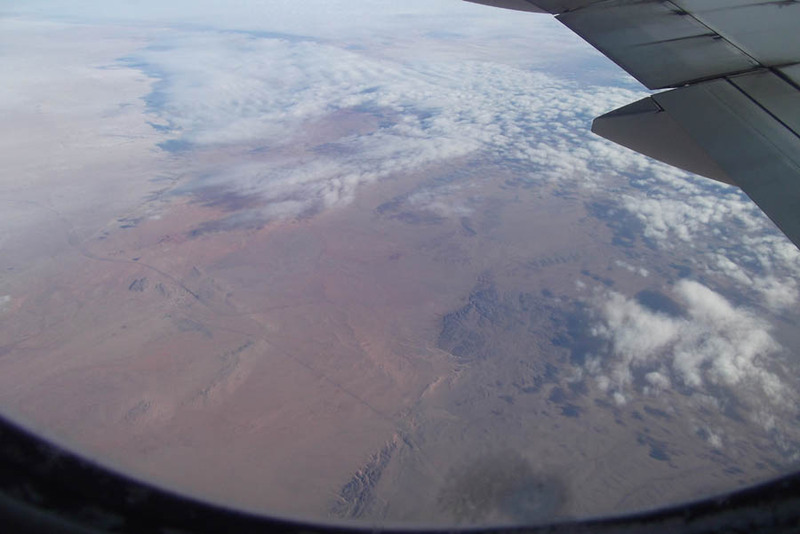 Some people can’t resist them, and others get vertigo just by seeing photographs of the view. About half of our tour group were really keen on going up the Shanghai Tower; the others waited in the bus and explored the traffic. I paid the entrance fee and joined the intrepid group of tower-hunters. We queued up for the security check where I lost my lighter and water again. We queued up for the free souvenir photo which you collected at the top, and for the Very Fast Lift. This made my ears pop, so losing the water was a bit annoying, but takes you up to the sightseeing deck in no time, travelling at up to 46 miles per hour. When built, it was the fastest lift in the world, and possibly still is. There seems to be a global competition to build the tallest skyscrapers. 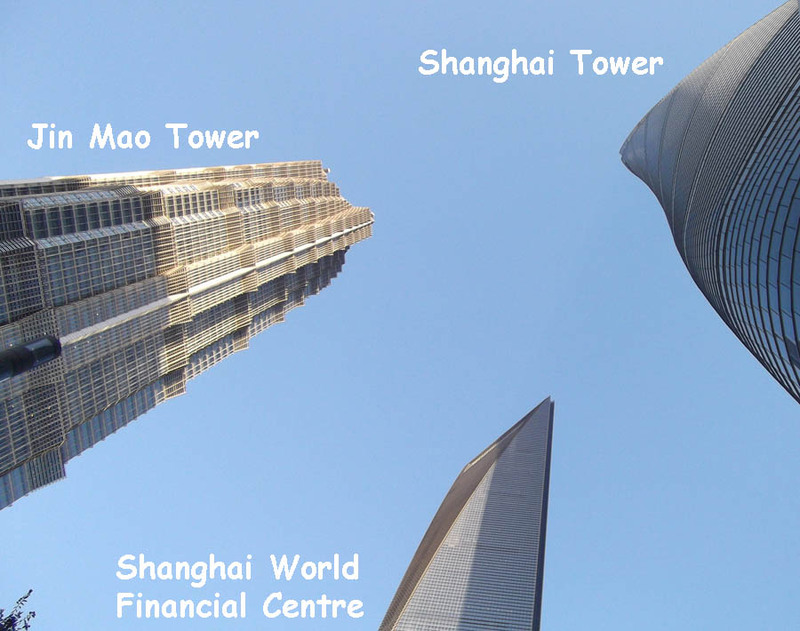 There are strict rules about what can be considered the actual top; the Shanghai Tower is 632 metres to the very tip. I was more interested in finding out about the building’s sustainable features. It’s enclosed in a transparent ‘skin’, and the space created is used to modulate the temperature inside, so reducing the need for electricity. Wind turbines near the roof generate 350 megawatts a year, about 10% of the power needs. A combined system for cooling, heat and power saves energy; water conservation measures also operate within the building. 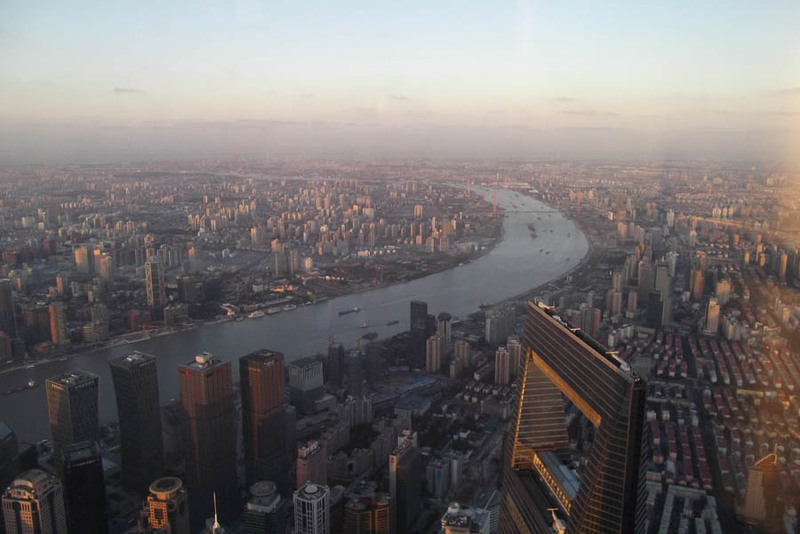 The highest hotel in the world, using the 84th to 110th floors, is due to open next summer. 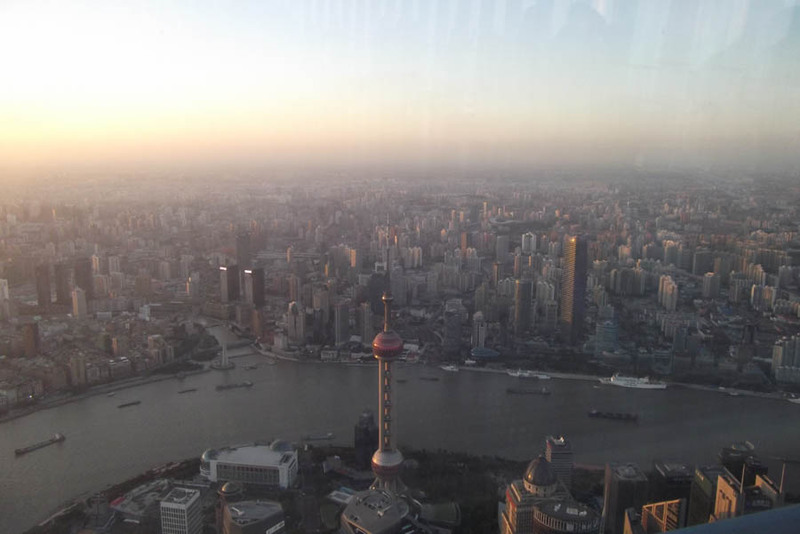 The Oriental Pearl Radio and TV Tower, at a mere 468 metres high, is a more established tourist attraction; I’d have liked to see the glass floor and the double decker lifts, but that’ll need to wait until next time. As will the unfenced glass walkway around the 88th floor of the Jin Mao Tower. 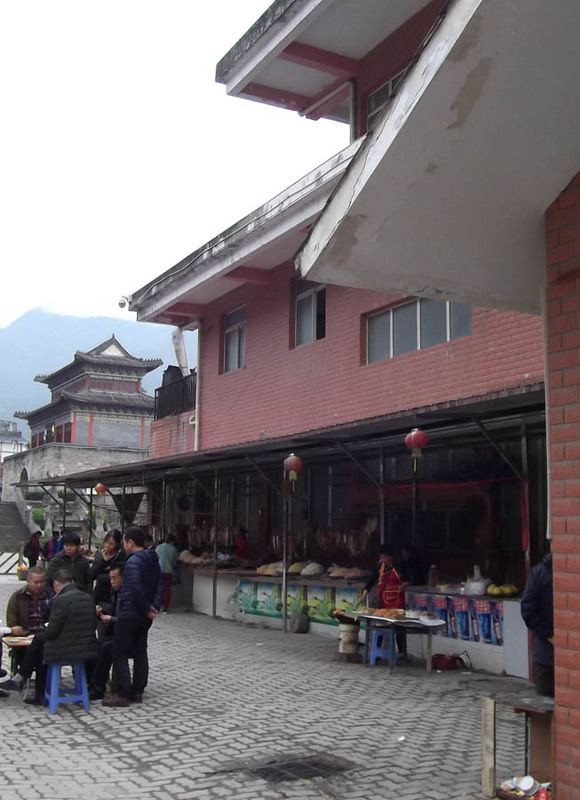 The next day was an early start, as we had a lot of sightseeing to do before our eight hour train journey to Yi Chang; we were on the bus by 8am, luggage all packed and loaded. One of the interesting breakfast options! The bus dropped us off at the Jiangnan silk factory. 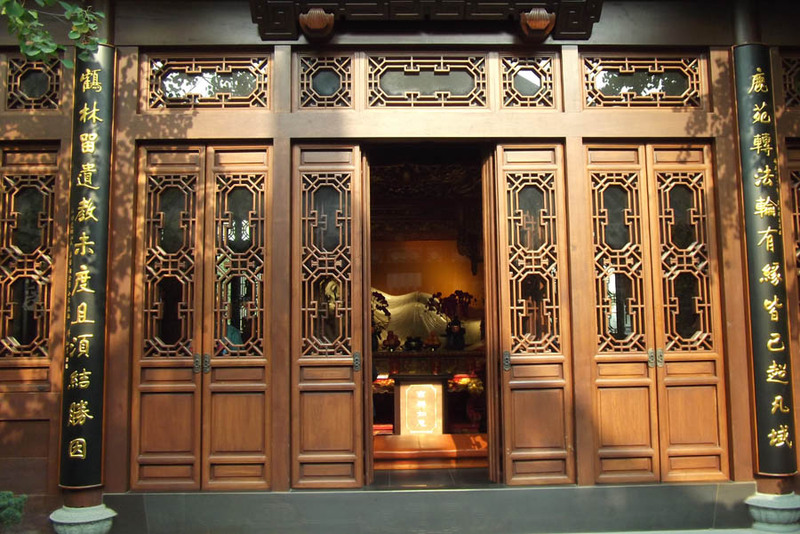 This incorporates a small museum covering the history of the Silk Road, which had several branches through China before focussing on Xi’an for the passage through the Himalayas. Silk, tea and other light goods took the land route. 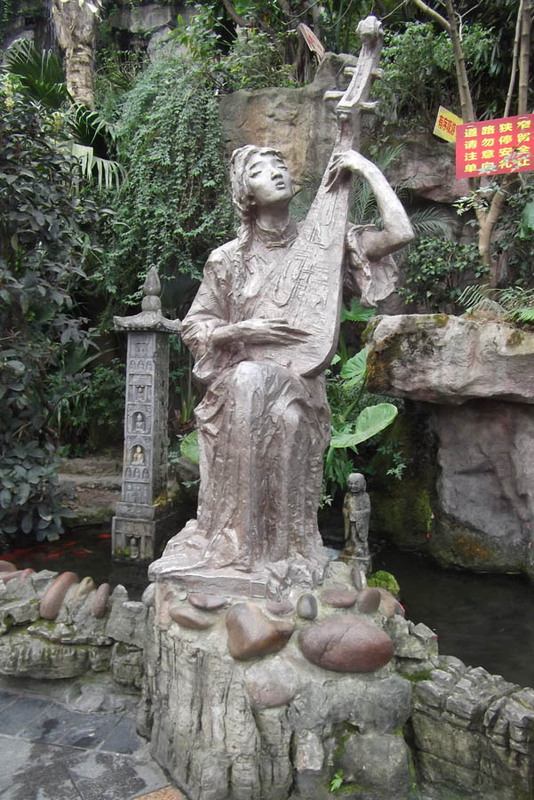 Heavier items, such as porcelain, travelled by ship along the sea route, from the Shanghai region as far as East Africa. 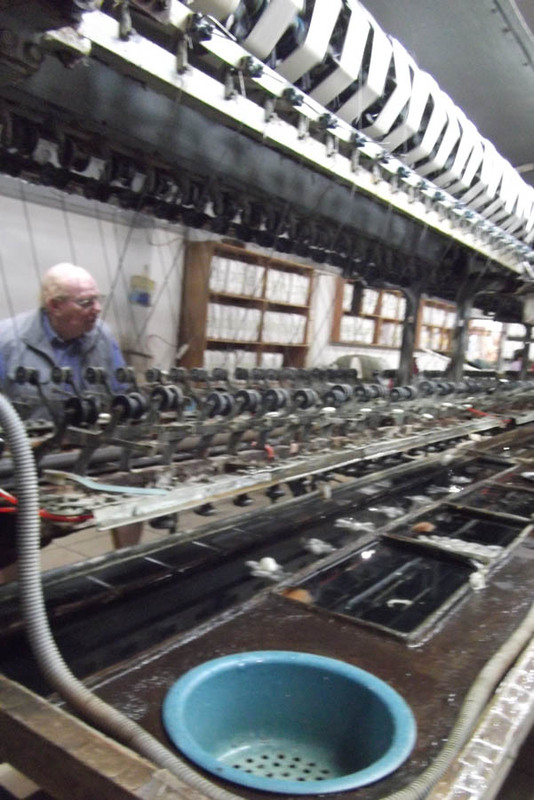 Further in, there’s an old silk reeling machine in working order; you can watch how the cocoons are unwound, each containing a single length of thread. 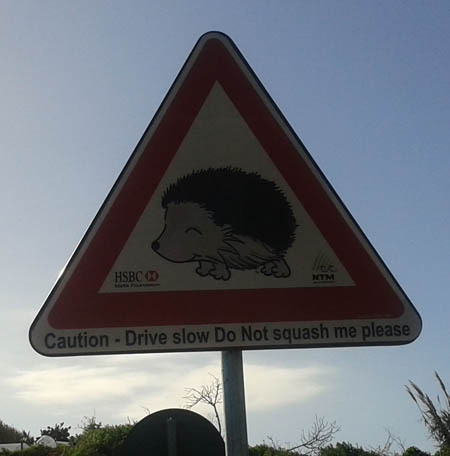 It’s not unusual for these to be over a kilometre long! Even so, the raw silk is so fine that it takes more than 600 cocoons to make a shirt. The larvae inside the cocoon are killed with boiling water; they’re often eaten, or used for fertiliser. Some firms claim to make ‘ethical silk’, but there is a debate about how viable this is. So far, the process had been much the same as the one we’d seen in Turkey, but then we were shown something new. A fine sheet of raw silk was teased out of a single cocoon, held at the corners by four women who gently tugged it into the size of a double quilt and laid it on top of a pile of similar sheets. Once the required thickness of silk was reached, it was enclosed in a cotton cover and became a silk-filled duvet. The prices were very reasonable, the weight easily manageable and we could fit a large double quilt into a quarter of a medium sized suitcase; the shop compresses them for you. Most of the hotels on our tour were using these; they were very comfortable. 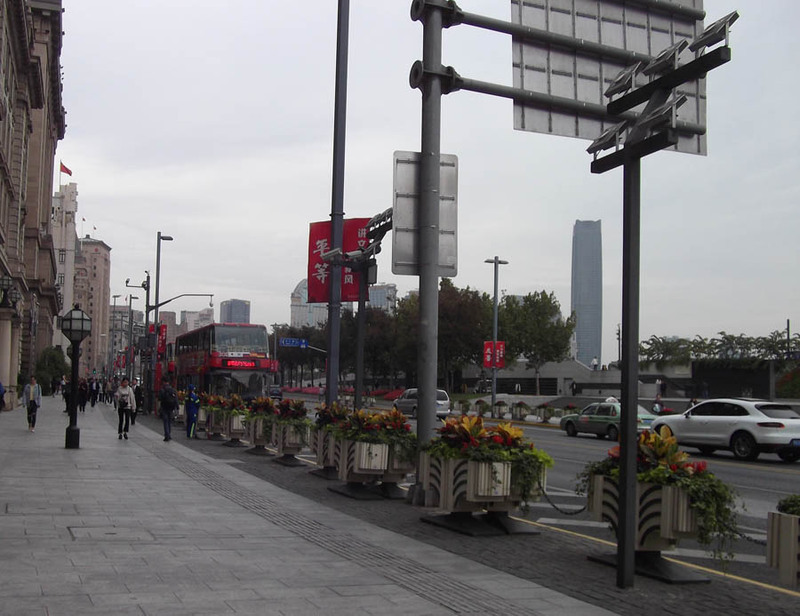 We got a lift from our tour bus to the Bund, where we had just enough time for a quick stroll along the historic waterfront area, formerly the British Quarter, before turning off into Nanjing Road. 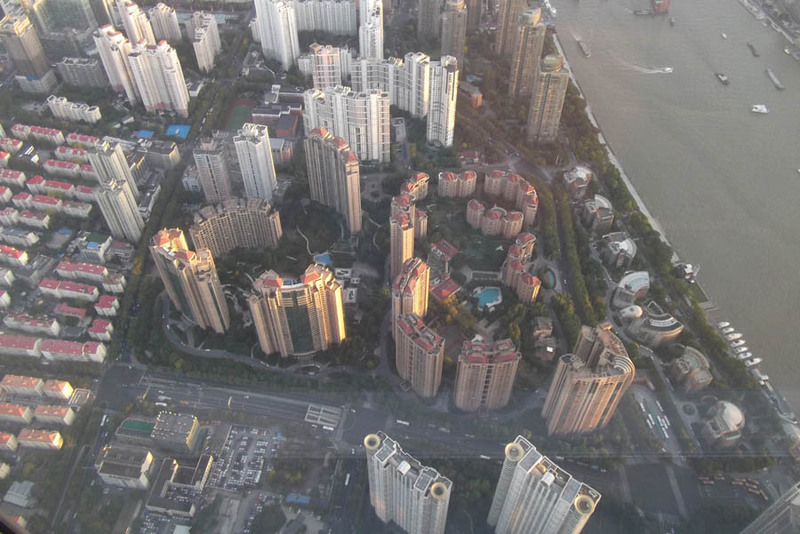 It’s worth doing some research before a holiday in Shanghai; you could easily spend a couple of days in this area alone. 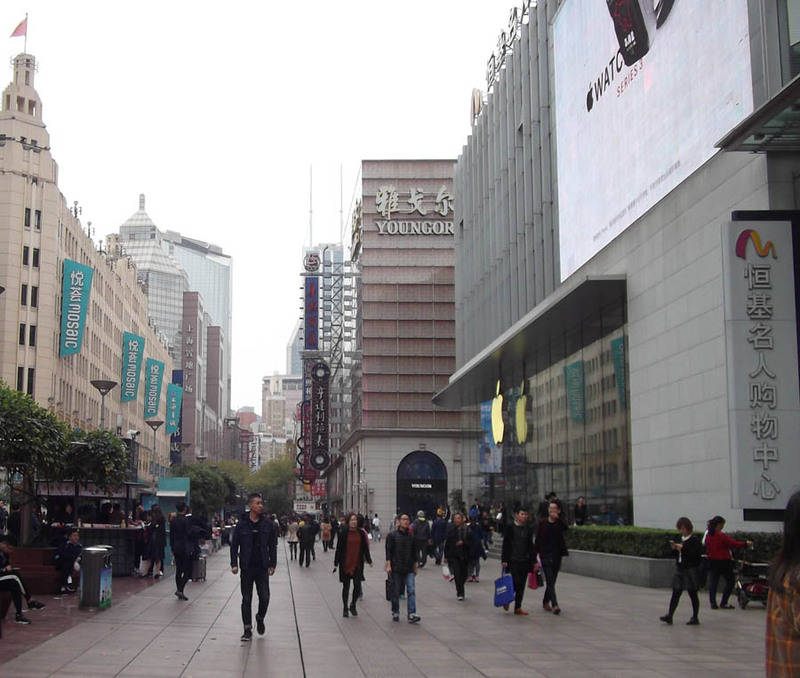 Some of the shops in this famous pedestrian street date back to the Qing dynasty; others are modern retail outlets. 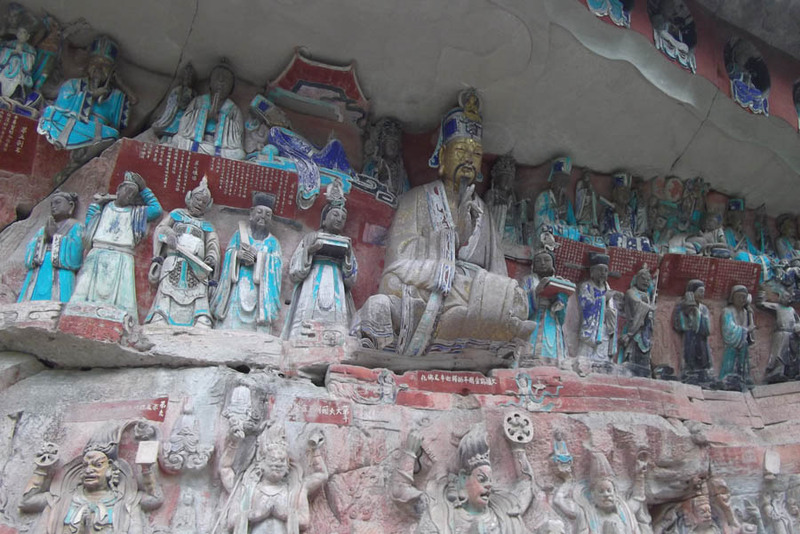 There are museums and temples worth a visit too. 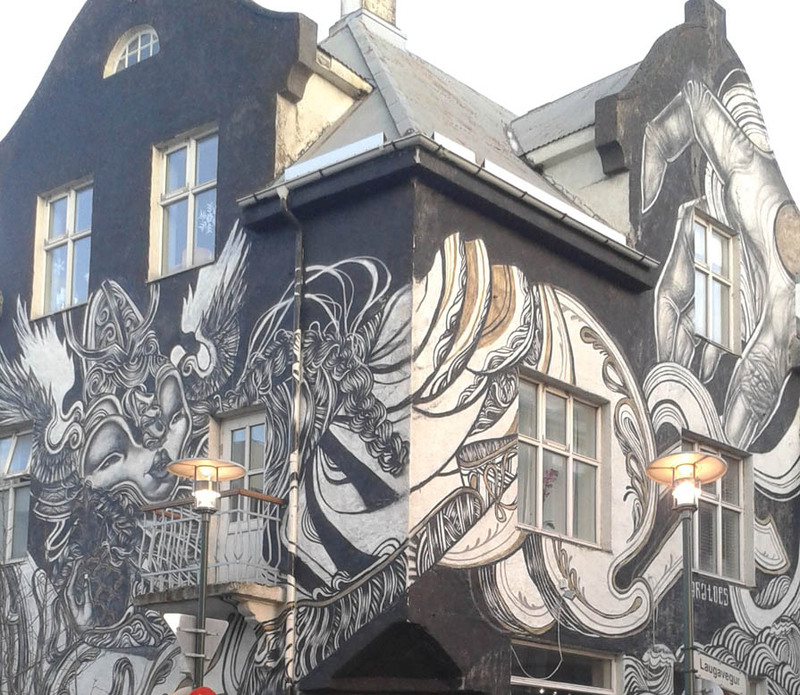 Although there are few vehicles using the main thoroughfare, watch out for the constant cross-traffic of bicycles and electric scooters from the interesting little alleyways leading off towards tiny stalls. 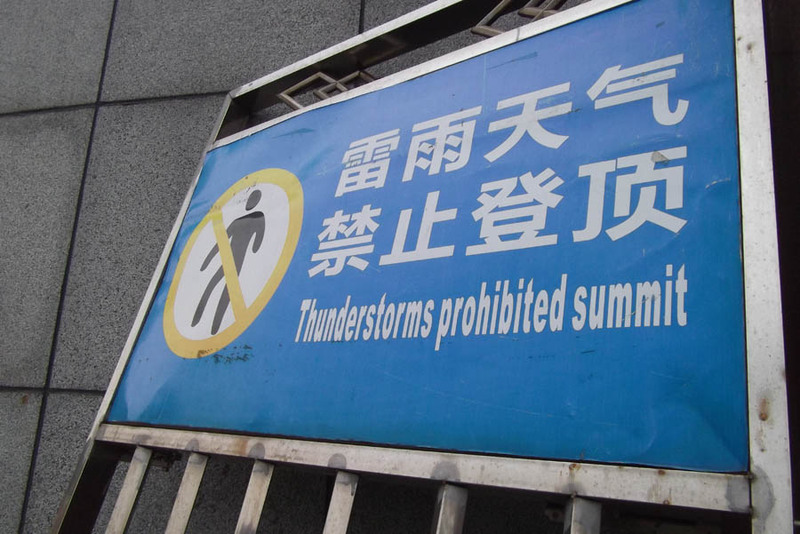 You can sample street food there, but it’s not advised unless you’re accustomed to it. Avoid also – if you can – the husslers and touts brandishing catalogues of watches or scarves to entice you into certain shops. They can be quite insistent, but are restrained by the ubiquitous presence of smartly uniformed police. 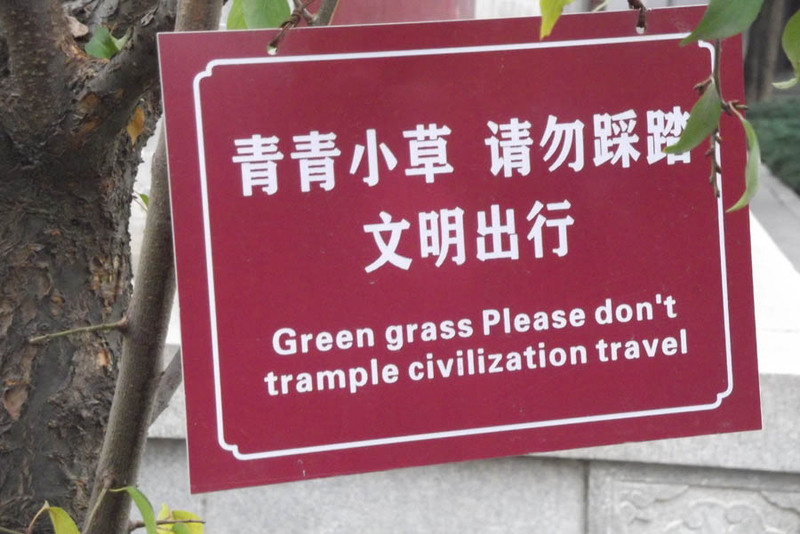 Ironically for a city whose name was once a byword for piracy, modern Shanghai is very law abiding! We were in a hurry to reach the train station by then, so any serious shopping was out of the question, but the potential was definitely noted. 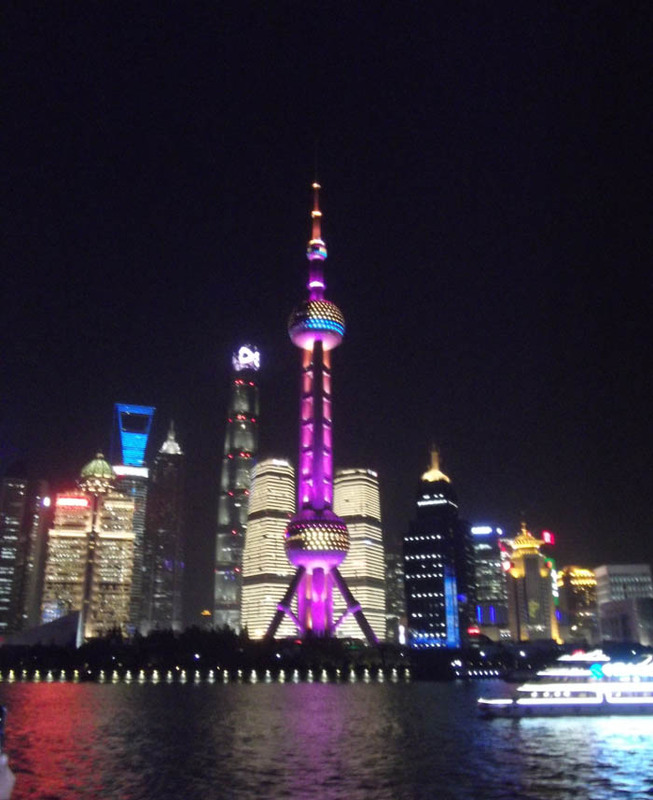 One could easily spend a pleasant week in Shanghai doing sightseeing and retail therapy. The weather was mild even in November, so your luggage won’t be cluttered up with thick jumpers, leaving plenty of space for silk quilts and the like. If you go as an independent traveller, don’t even think about hiring a car. Join a local day tour, take a taxi, use public transport. Just avoid the last during the rush hours. 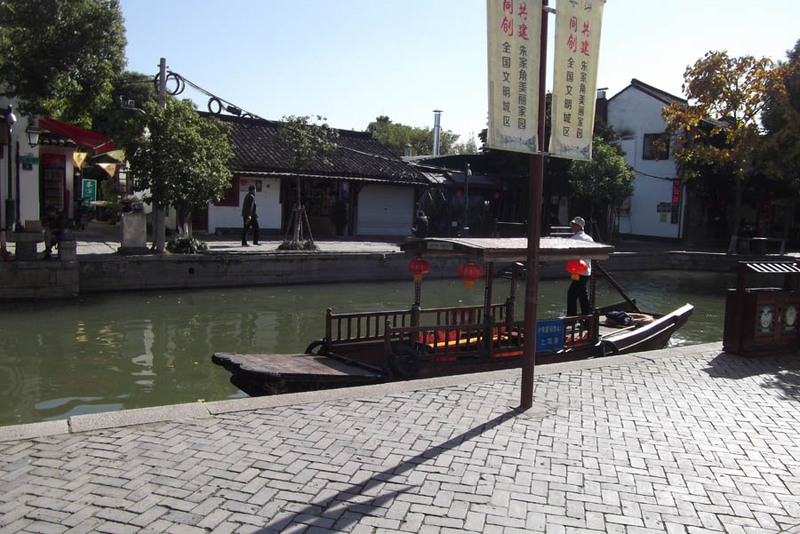 On the second day, there was a trip to one of the water villages around Shanghai. 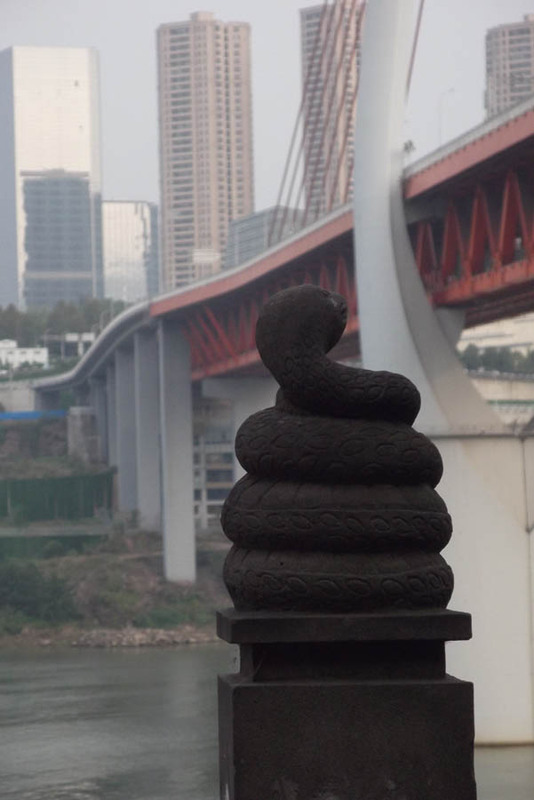 The city is built on the delta of the Yangtze River; the surrounding countryside is crossed by many small rivers. 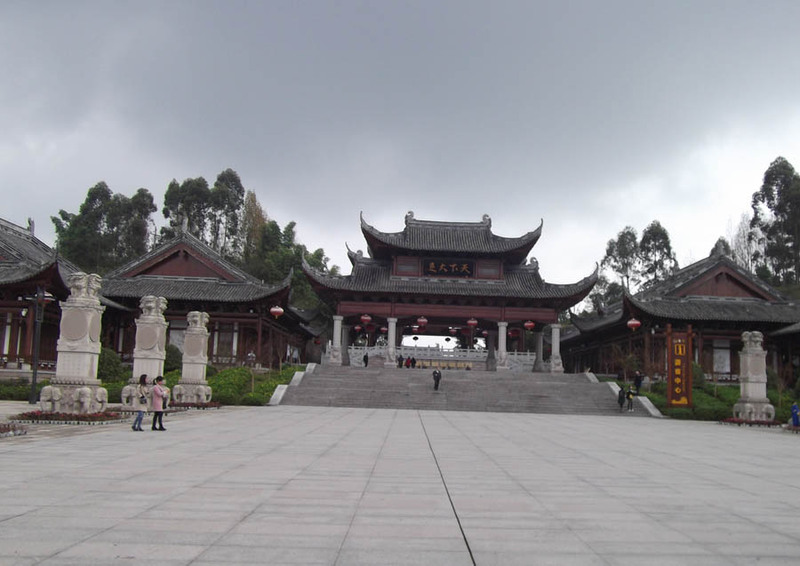 To the west of the urban area, there are several ancient towns which preserve much original culture. 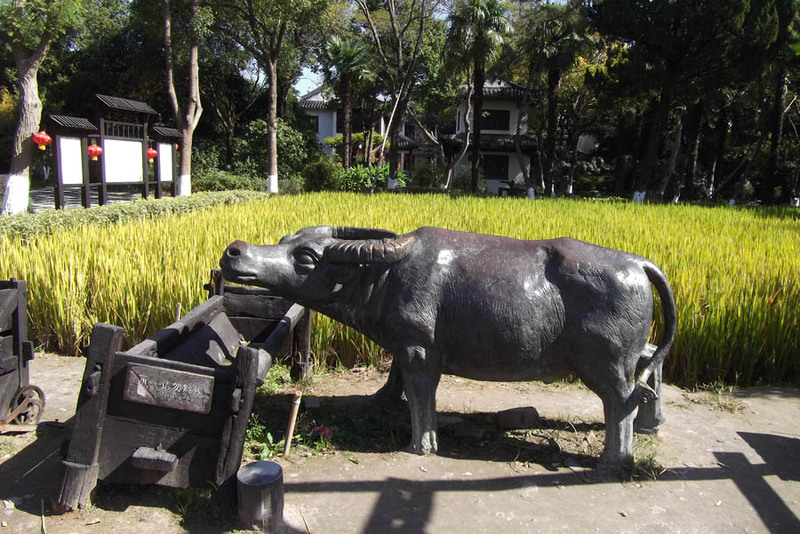 We were going to Zhujiajiao, about 50 km from the city. 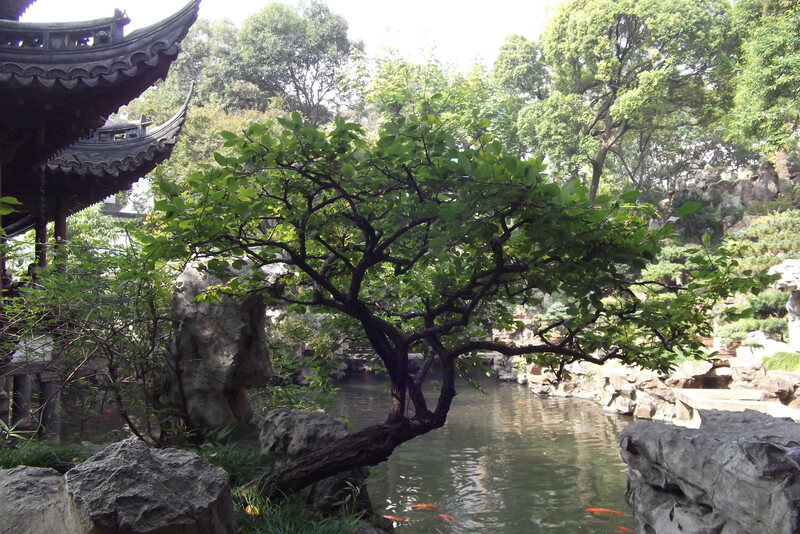 We began our explorations in the Kezhi Gardens. Our guide led us through the living areas, now displaying various examples of the crafts once practised there, to a large room which housed a model of the original design. 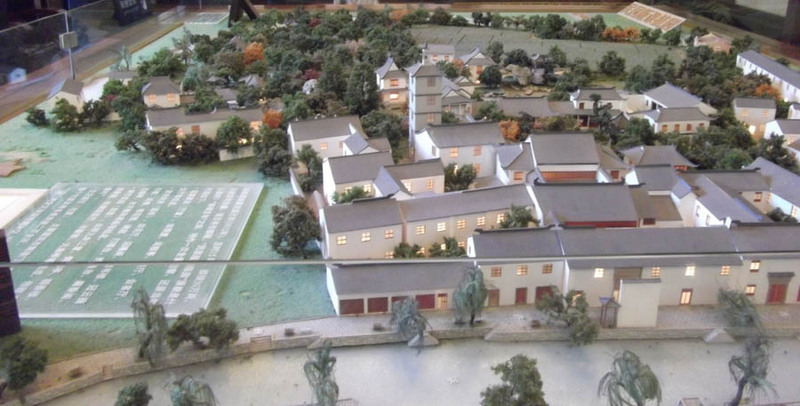 I was stunned – it was an exact depiction of the imaginary ‘resilience village’ which I’d described in ‘Recipes for Resilience’! 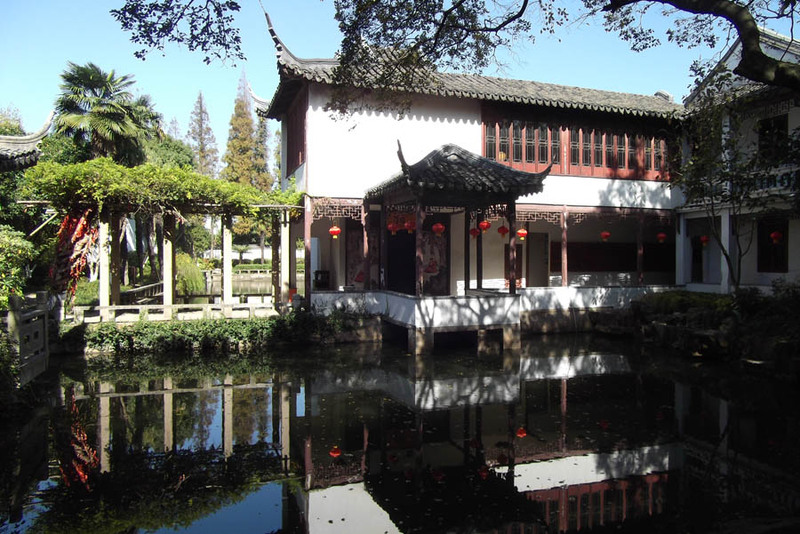 The establishment used to house not only an extended family, but also students learning about plants. 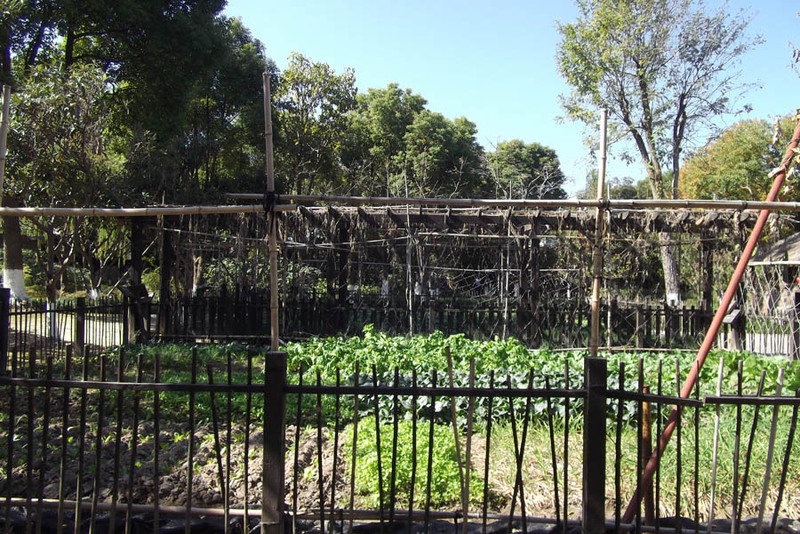 The ethic was that the whole community would work on the fields and vegetable gardens, as well as studying, in order to have a balanced life. Although the place had undergone changes – at one point it was a junior school, and is now an exhibition – the small craft workshops still housed skilled artisans. 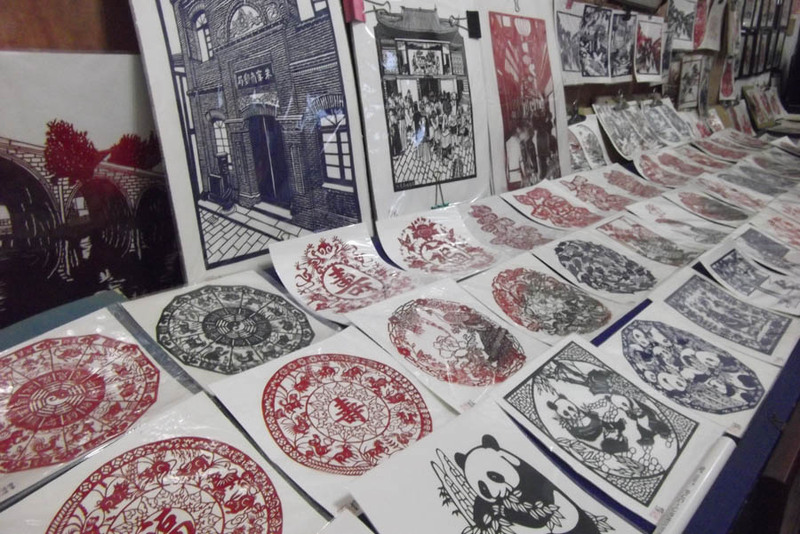 You can watch paper-cutting, calligraphy and embroidery; pick up some pretty souvenirs. Some of the extensive fields survive as a demonstration area on the other side of the lovely formal gardens. I saw rice ready for harvest for the first time; it certainly seems to give a good yield of grain. The garden itself was lovely. 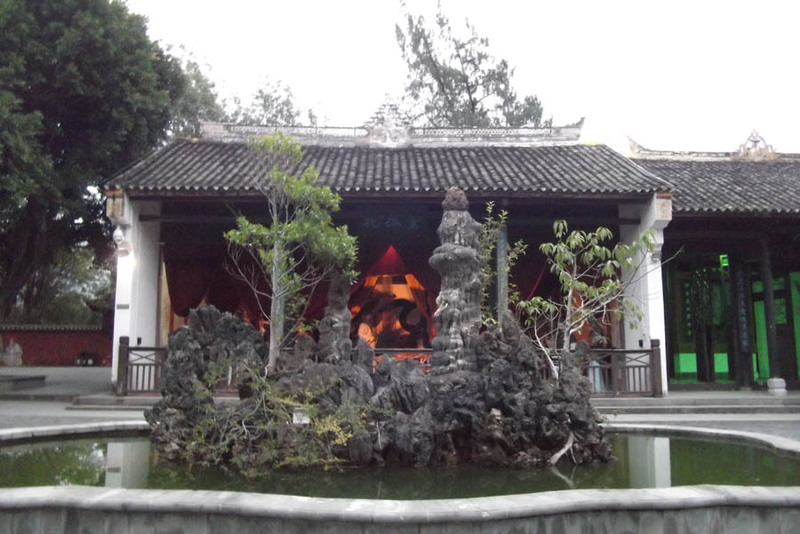 There was more space here than in the Yu Yuan; the water features were more intricate and the pavillions grander, with higher levels. You can see more pictures here, and read a brief history. Too soon we had to continue our tour, emerging to take a walk along the riverfront and down the narrow colourful alleyways. These were lined with small stalls – the weather is quite warm here, even in November – selling all manner of enticing articles. Often the craftspeople themselves would be there, working on their next piece as they waited for customers. 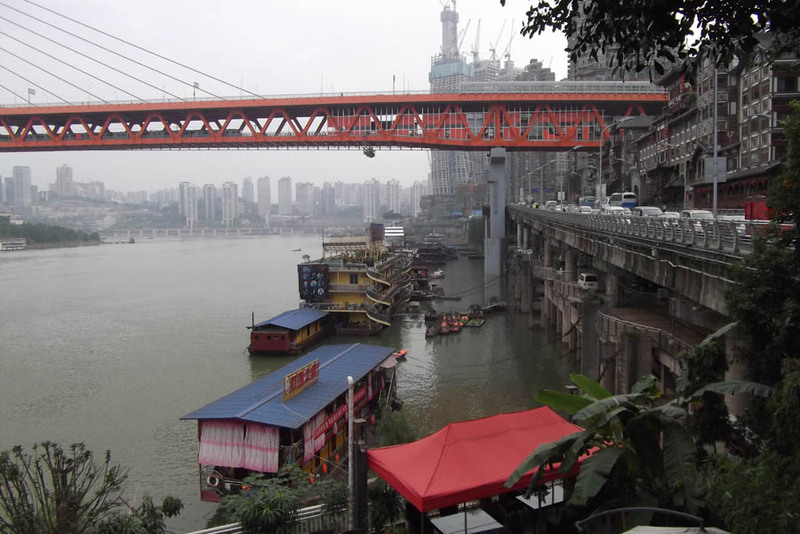 We paused for roll call by the famous Fang Sheng bridge, and were let off to explore. 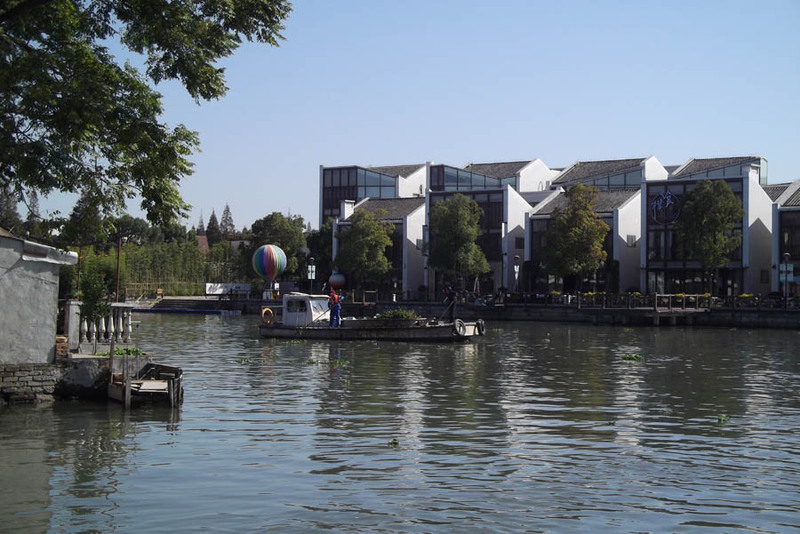 Across the bridge was an area of new development; modern apartments and shops, with the ubiquitous Starbucks. Part of the old bank was artificially preserved to ensure the survival of the old culture; the rest seemed to have managed it unaided. 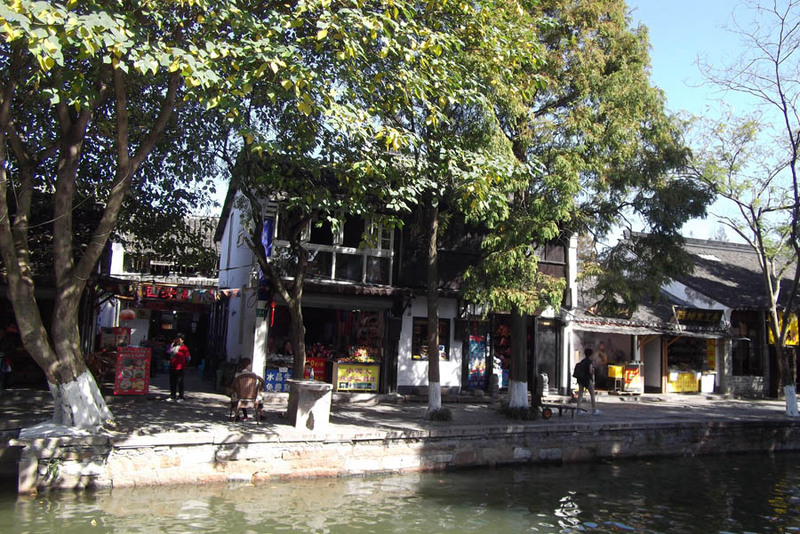 Zhujiajiao water village is one of the closest to Shanghai. If you’re feeling adventurous, you can get there by public transport. 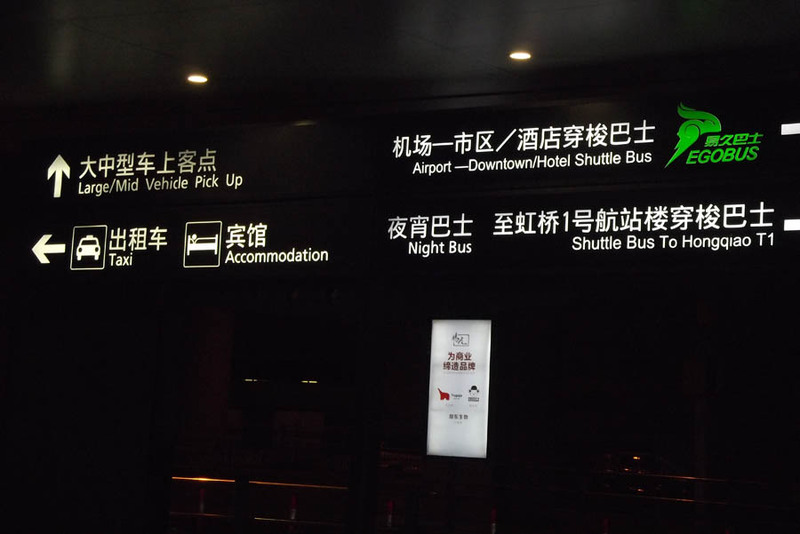 Most city hotels provide small bilingual cards at Reception, instructing taxi drivers on returning wandering guests to the right address; make sure you pick one up if you’re going exploring without a guide.